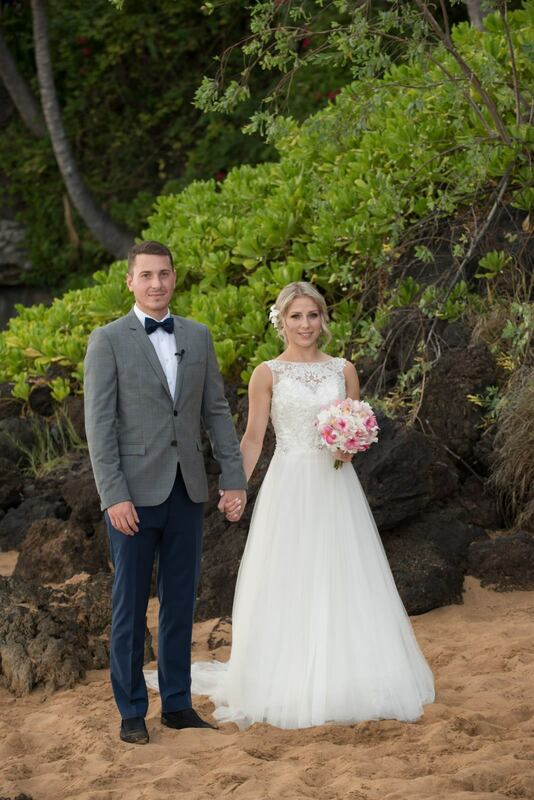 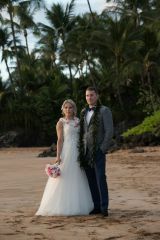 Oksana & Vitali married on Paipu beach, we had a couple minutes of light rain and we all prayed for it to stop as the bride was almost in tears, clouds cleared and the rest you can see in the photos. 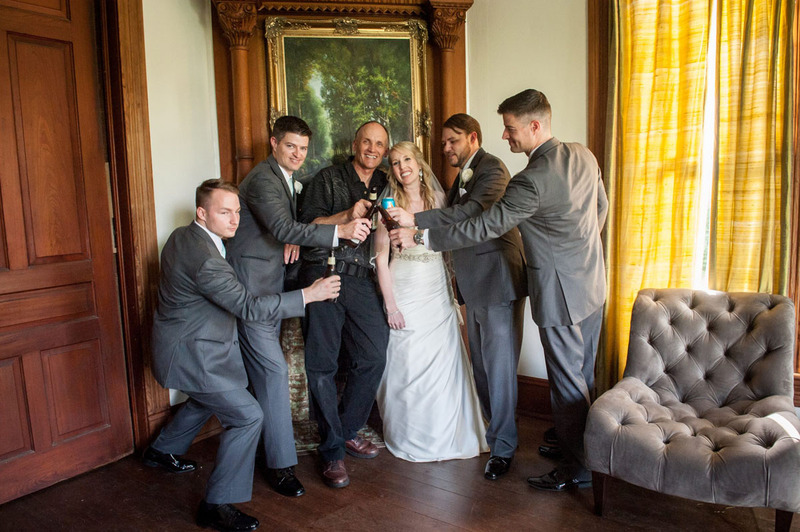 Working with some of the best professionals around, Arabelle, Laki, Tarvin and Stephan. 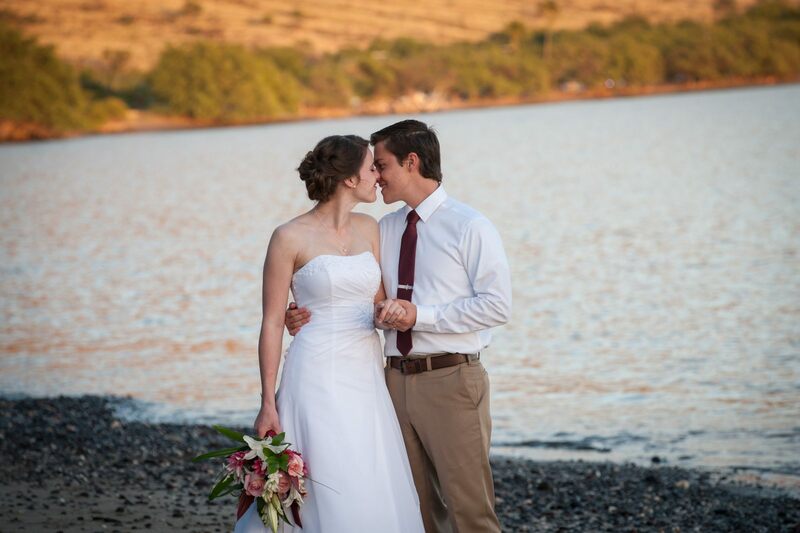 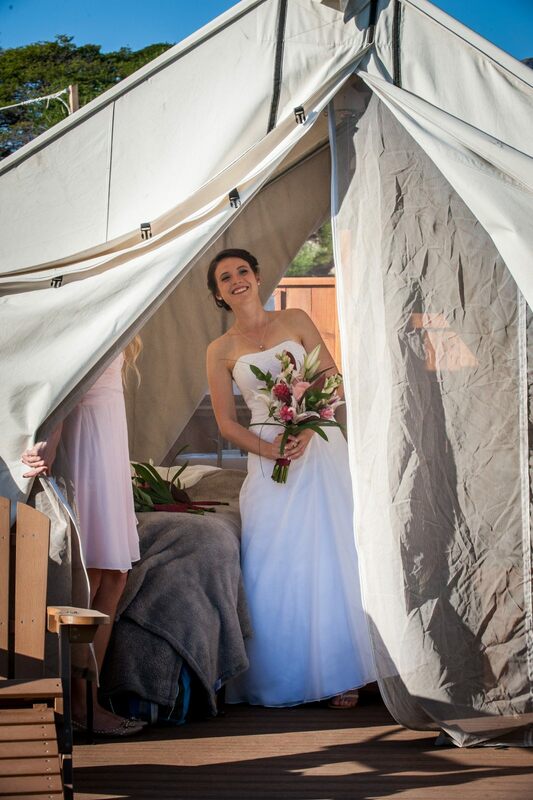 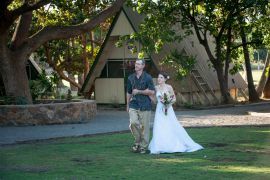 Colene and Thomas were married on January 4th at the Olawalu campground. 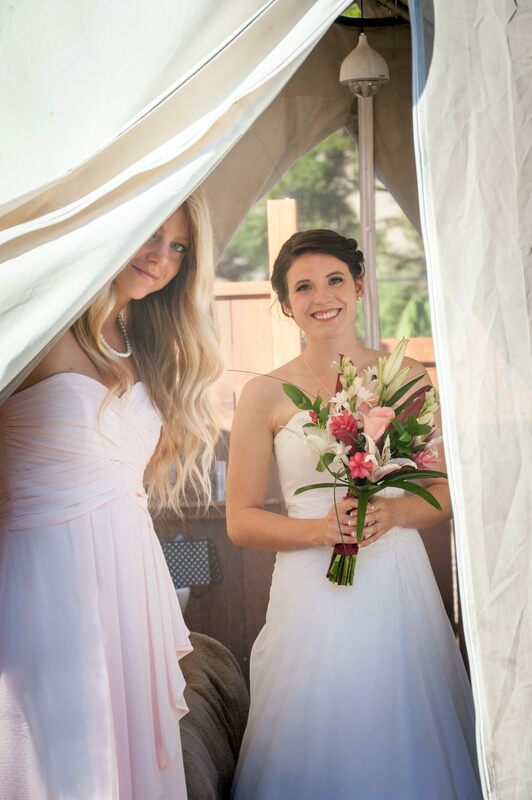 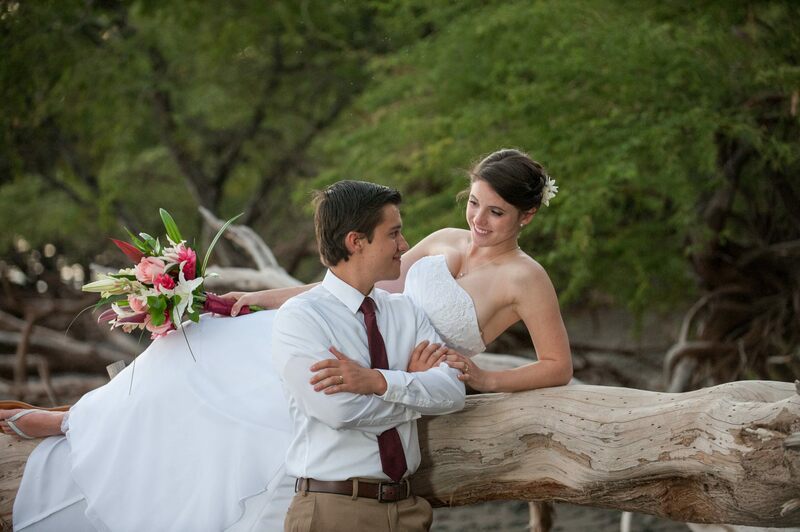 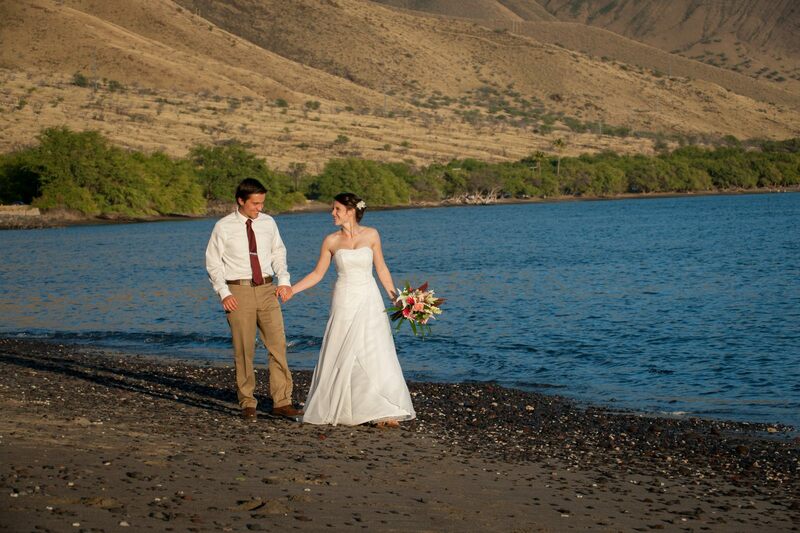 They met back in 2012 in Logan, Utah while attending the same college and church. Thomas proposed to Colene in July of 2015 with a surprise as he asked Colene to help him with his car. 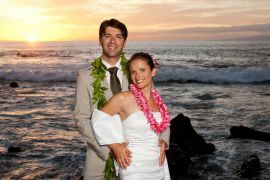 With a little extra time on the way they decided to drive in a canyon, which happened to be the place of a special date they had in the past. Unaware, Colene thought the detour was spontaneous. She was taken to a bridge that crossed a stream; the same place the couple was before. 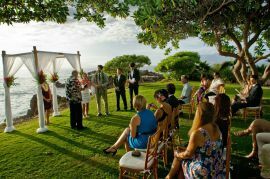 There they found a blanket with flowers. 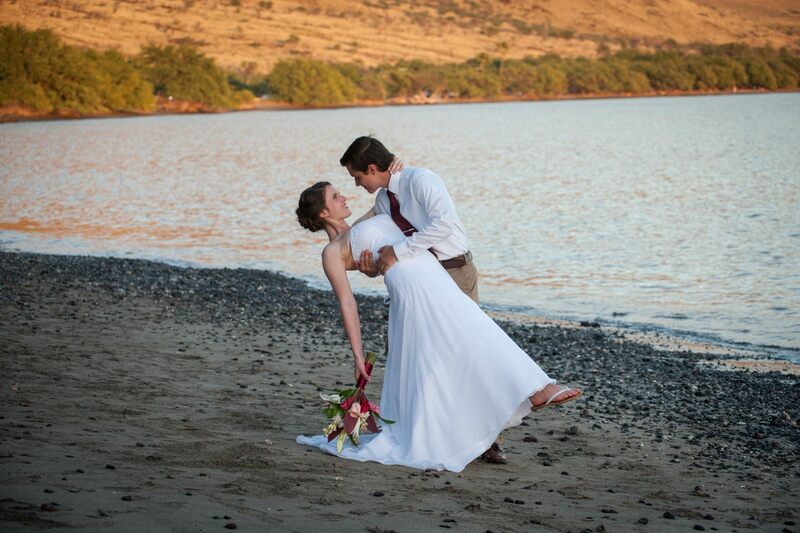 Colene realized that this was no longer by chance. 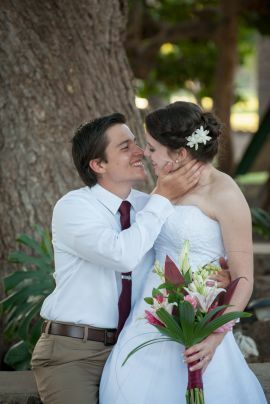 At that moment, Thomas gave her the flowers and asked her to marry him. 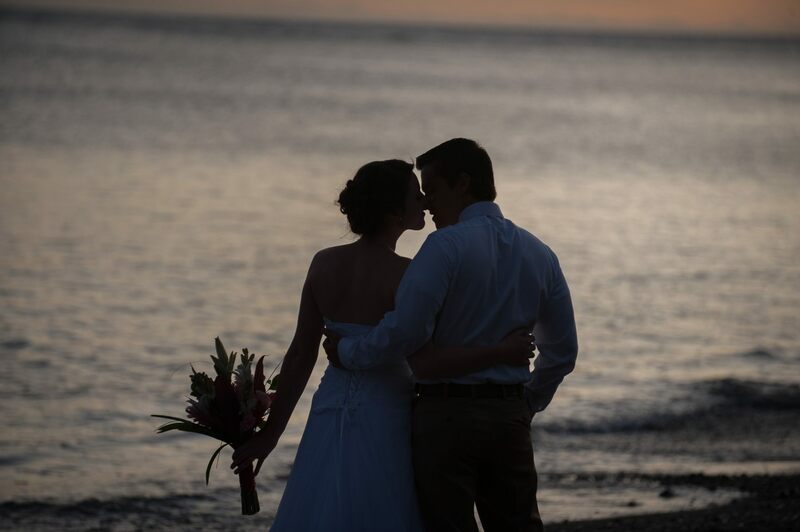 She said yes. 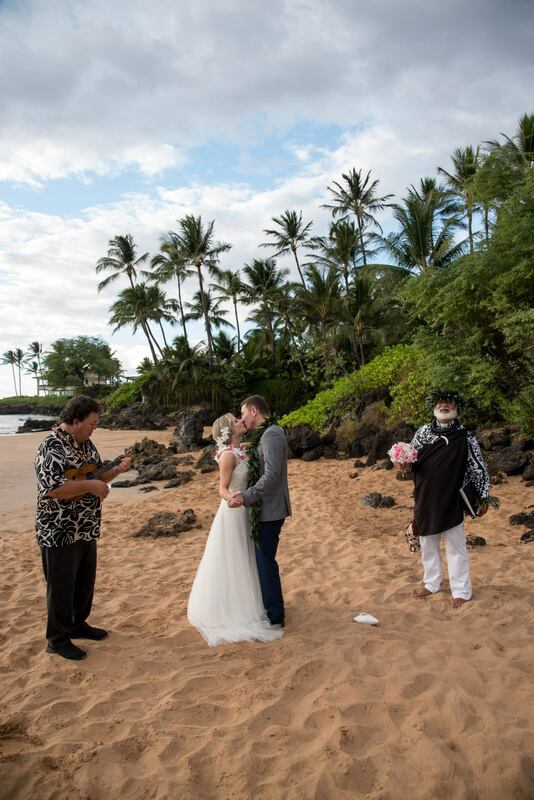 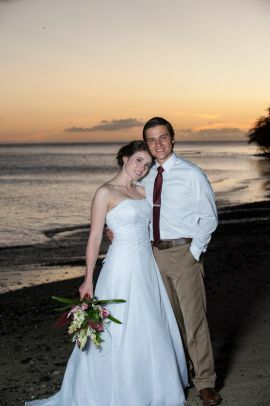 They decided to be married on Maui as that is where Thomas was born and raised. 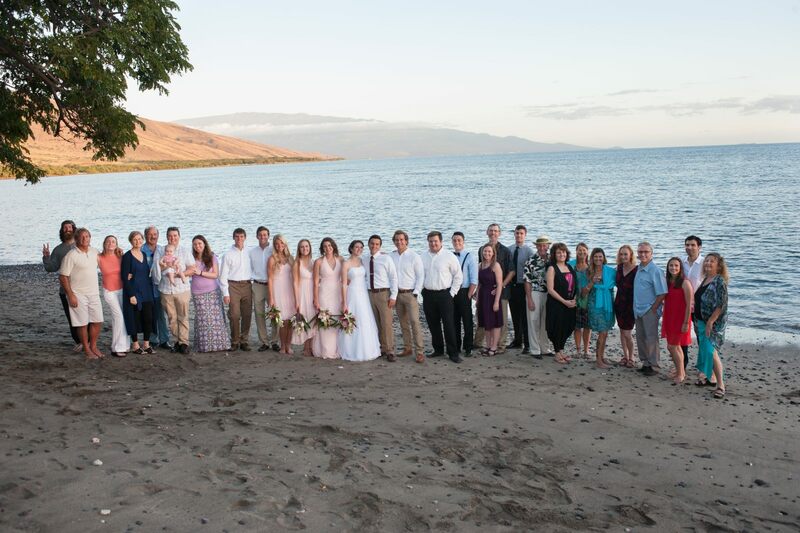 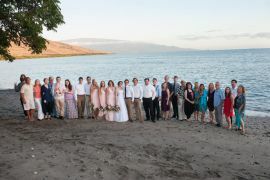 It was a beautiful day in Olawalu, Maui with about 20 guests. Pastor Rob Finberg of Grace Bible Church performed the ceremony. 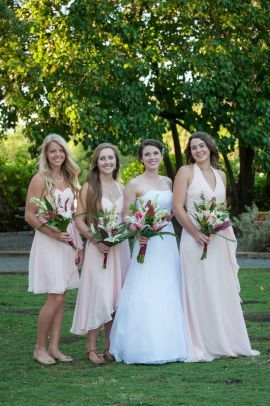 The bridesmaids each wore their own unique chiffon dresses from David’s Bridal. 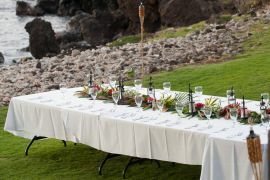 Catering was done by Brigit and Bernards. The Pink Champaign cake with Strawberry filling was from Cravings Hawaii. Hair, Makeup, Flowers, and pretty much all things planning and decorating was done by my friend Lyndsay who is going to school at Utah State University in Business and hopes to become an event planner when she graduates this spring. 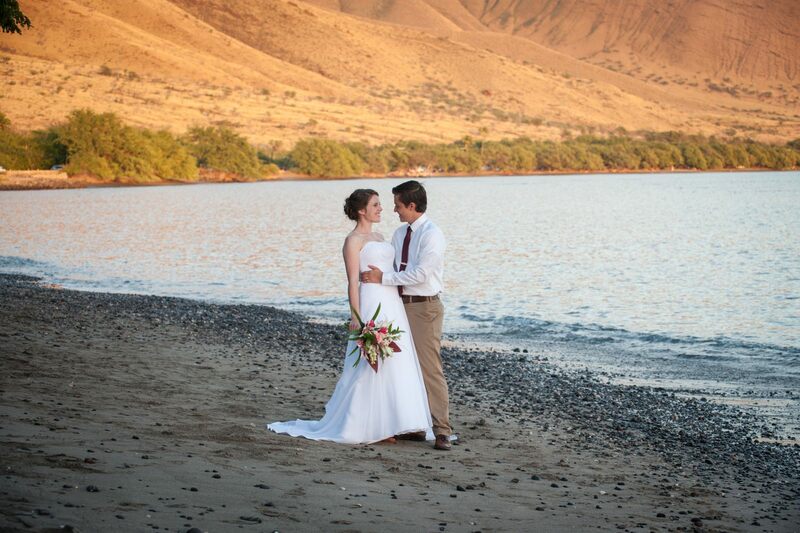 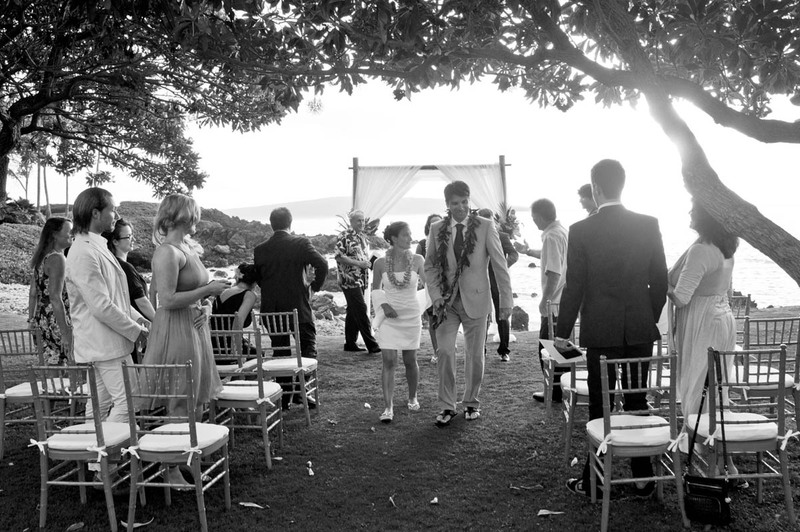 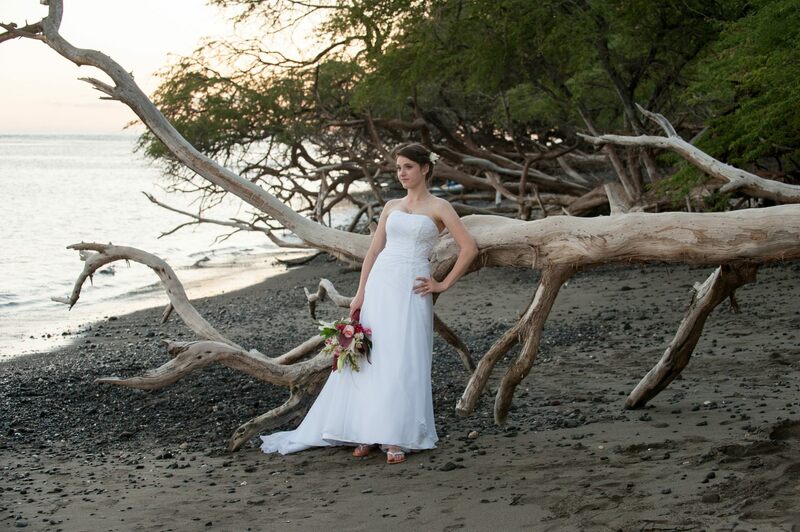 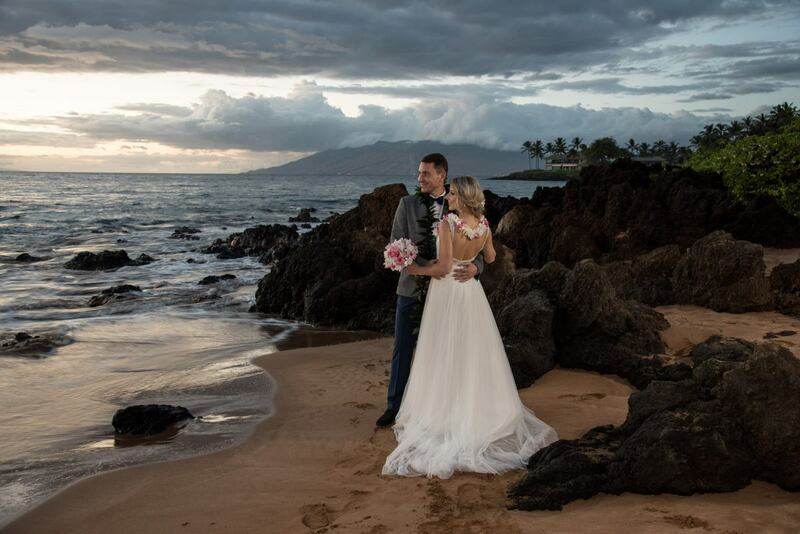 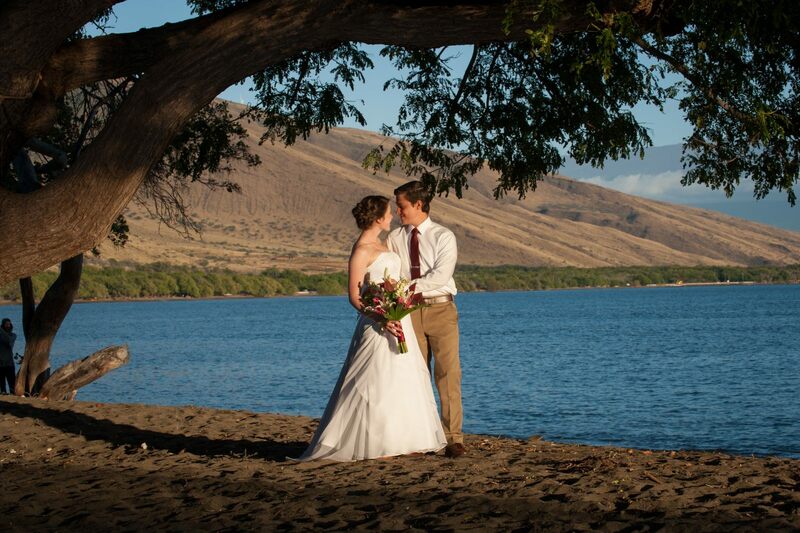 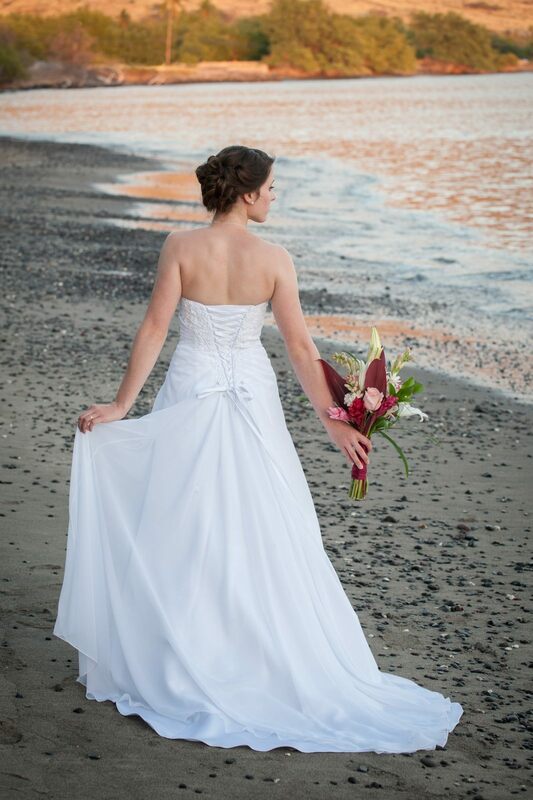 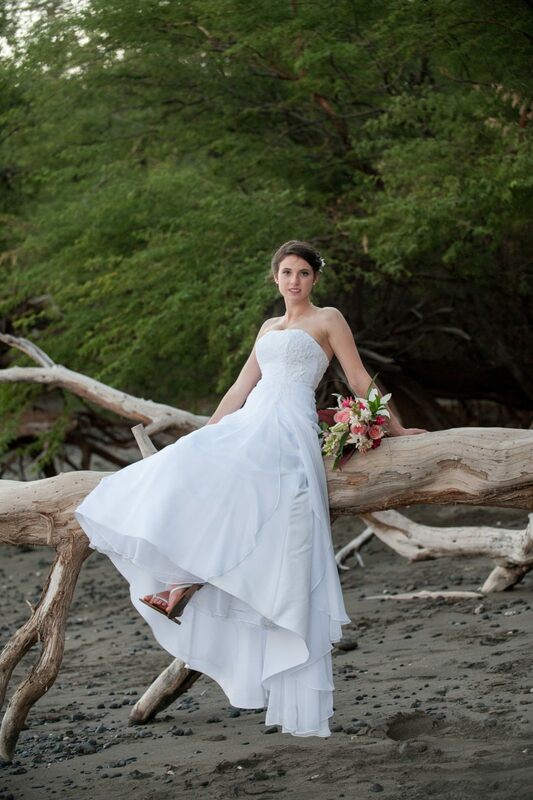 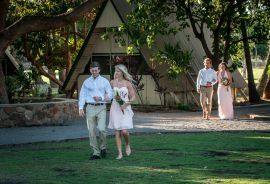 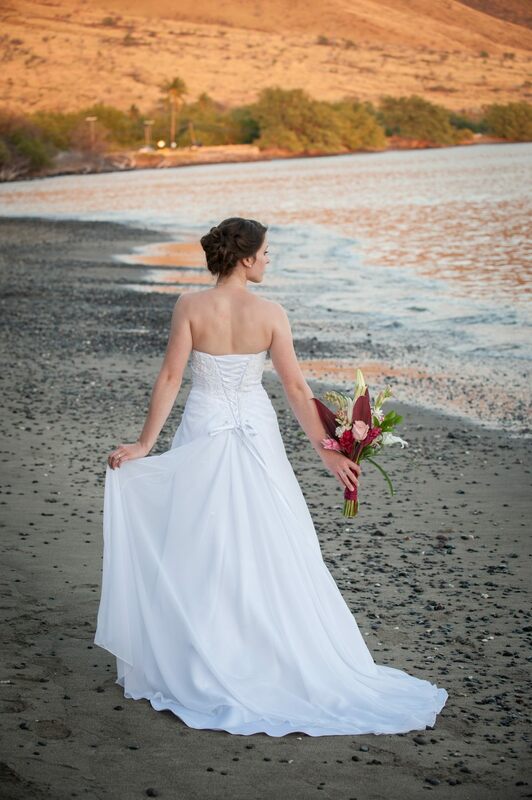 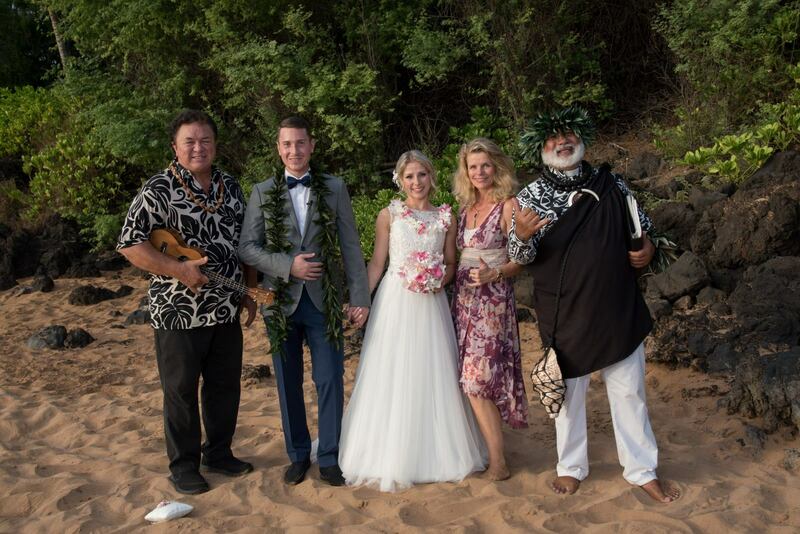 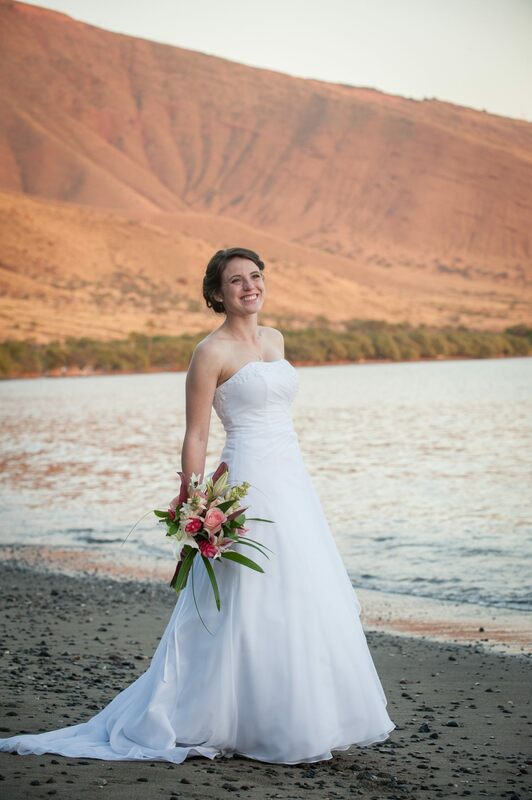 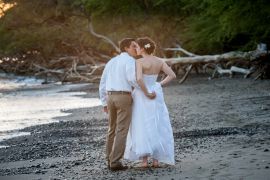 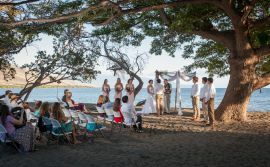 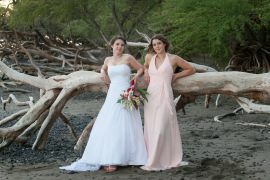 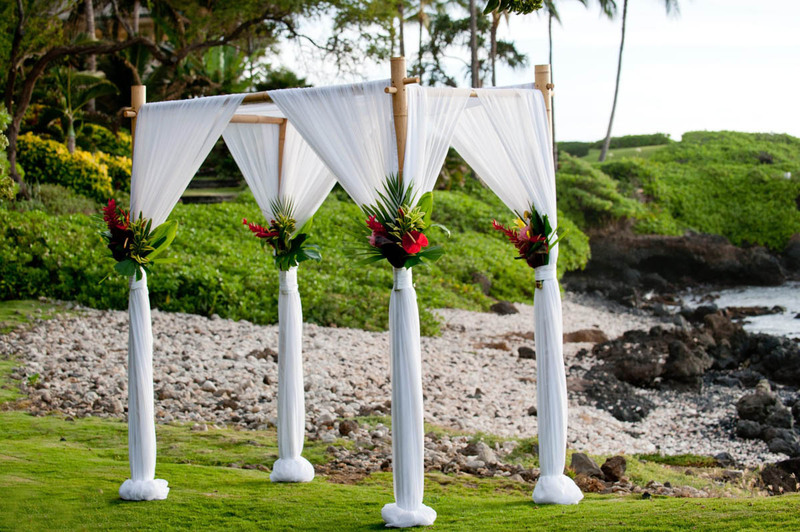 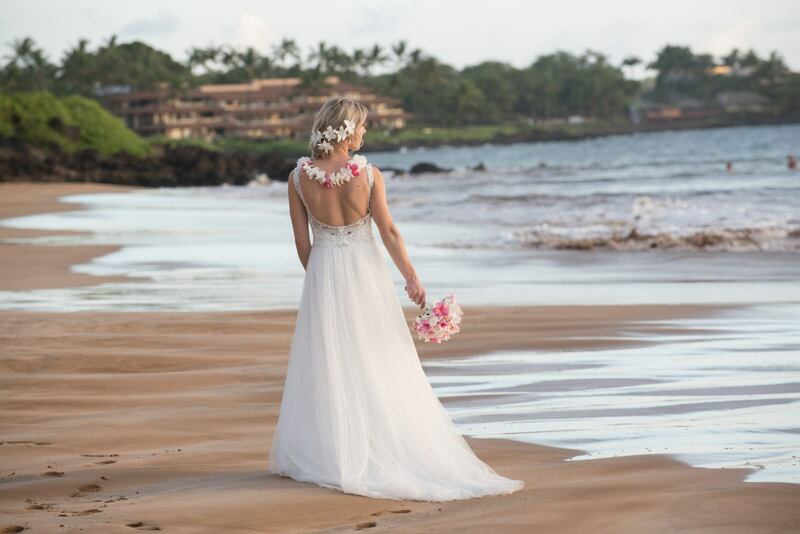 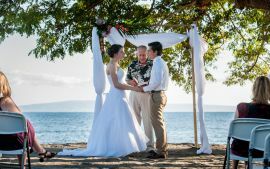 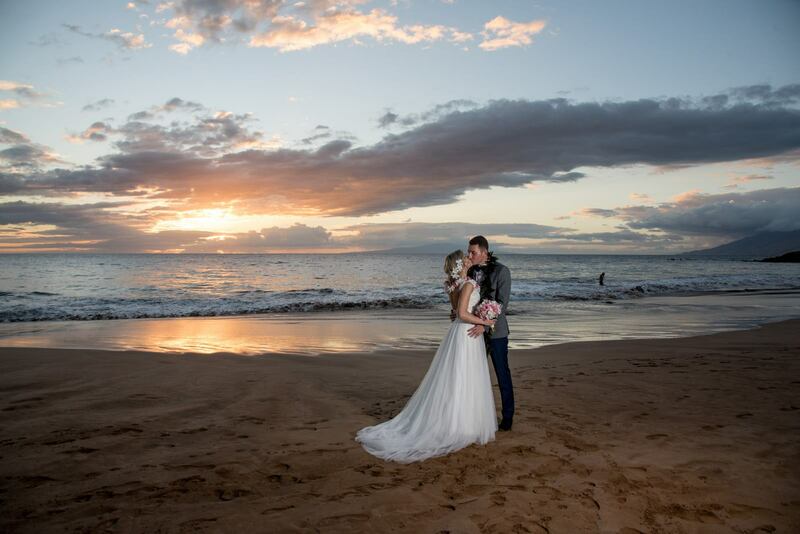 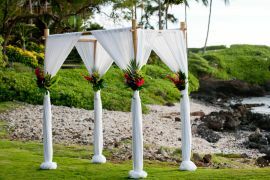 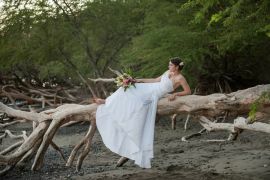 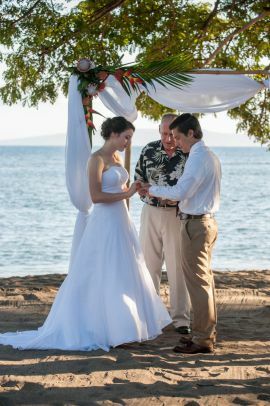 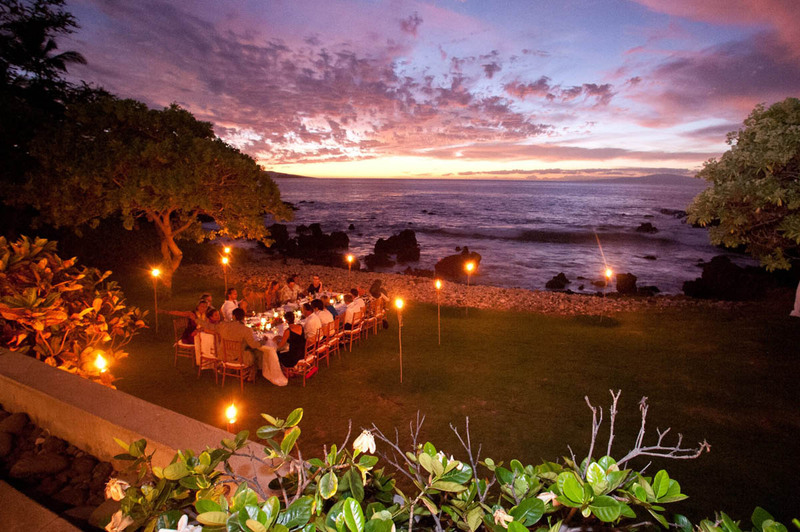 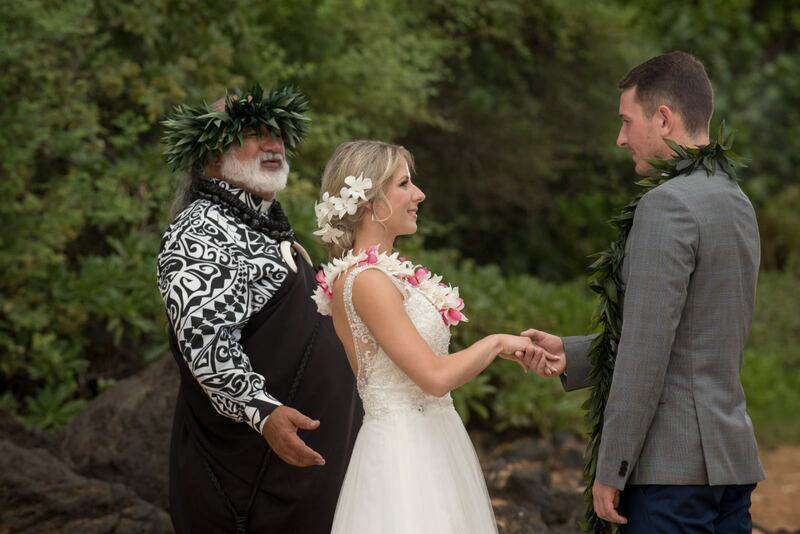 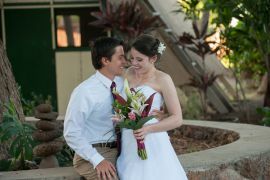 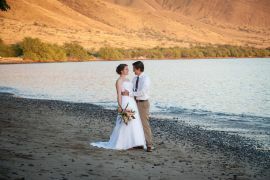 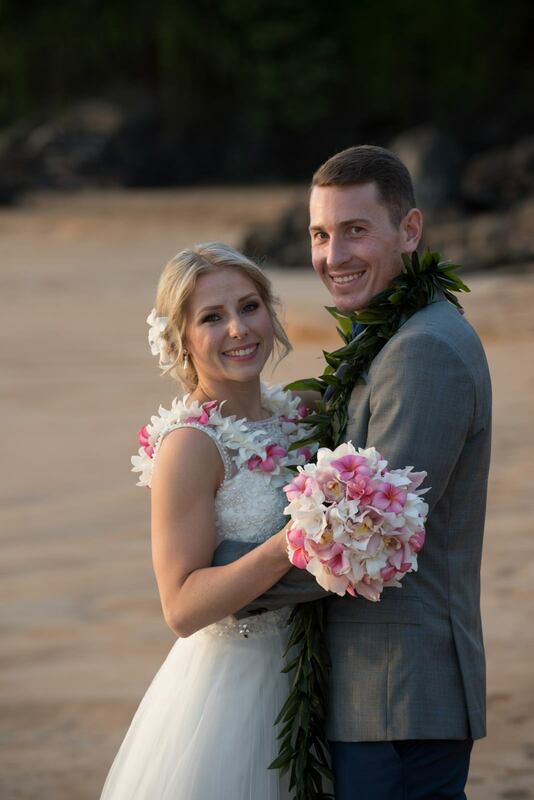 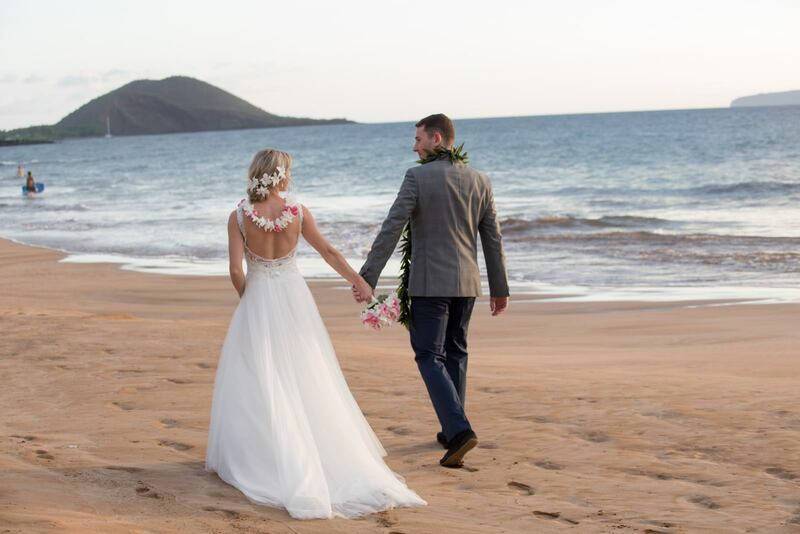 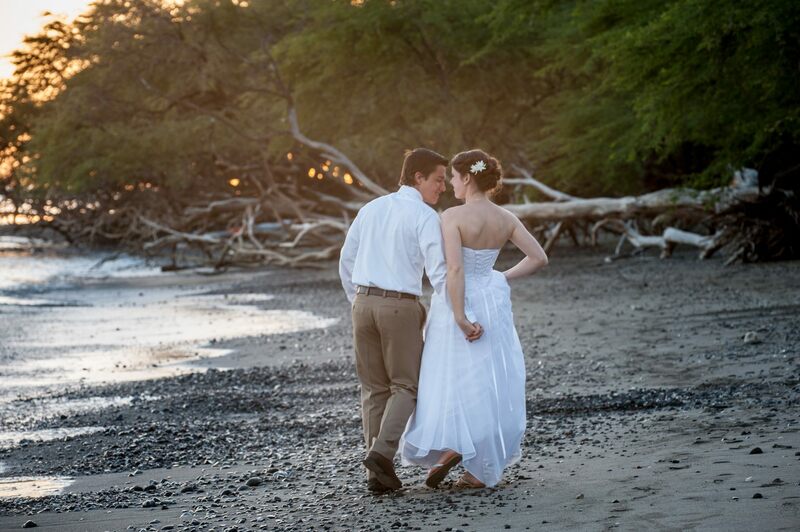 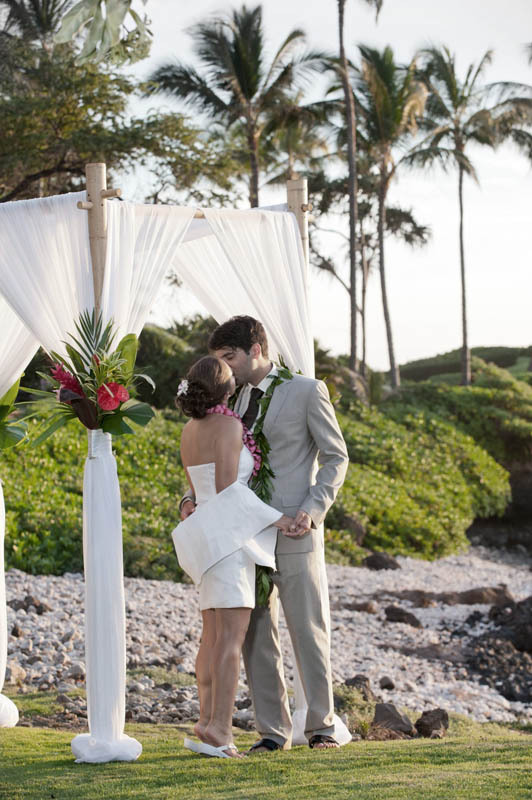 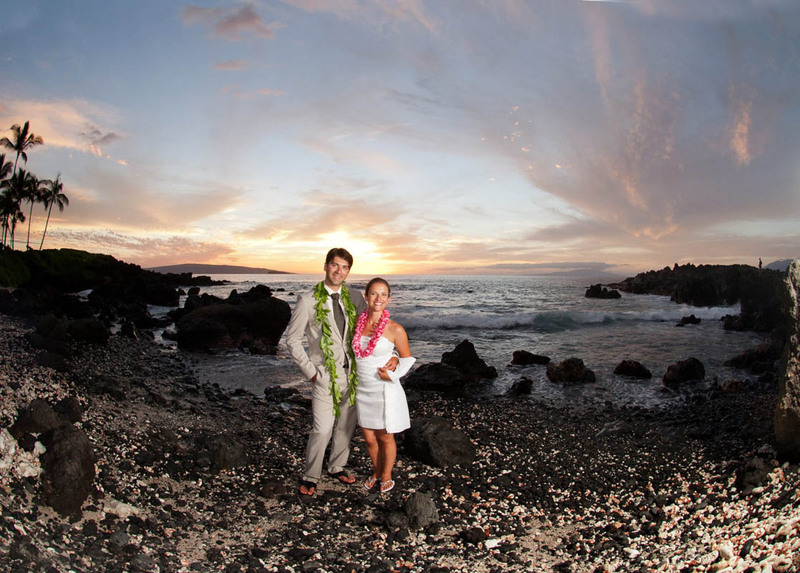 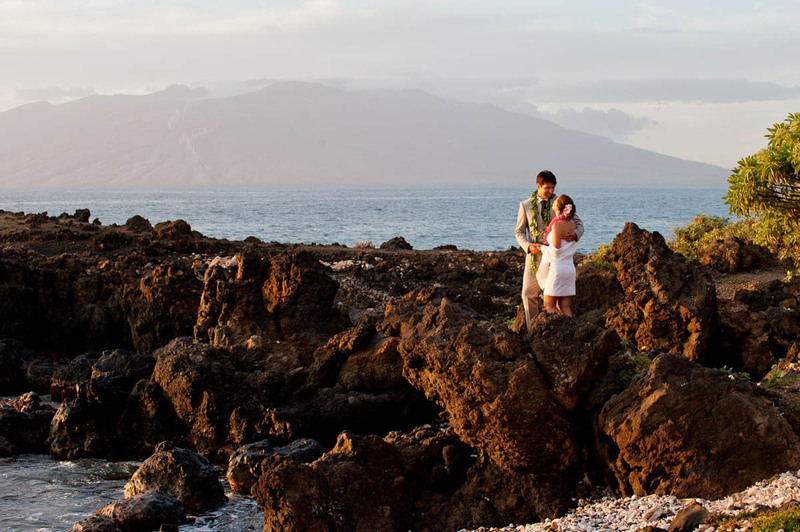 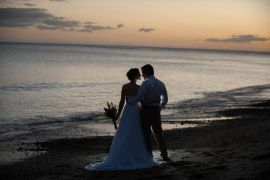 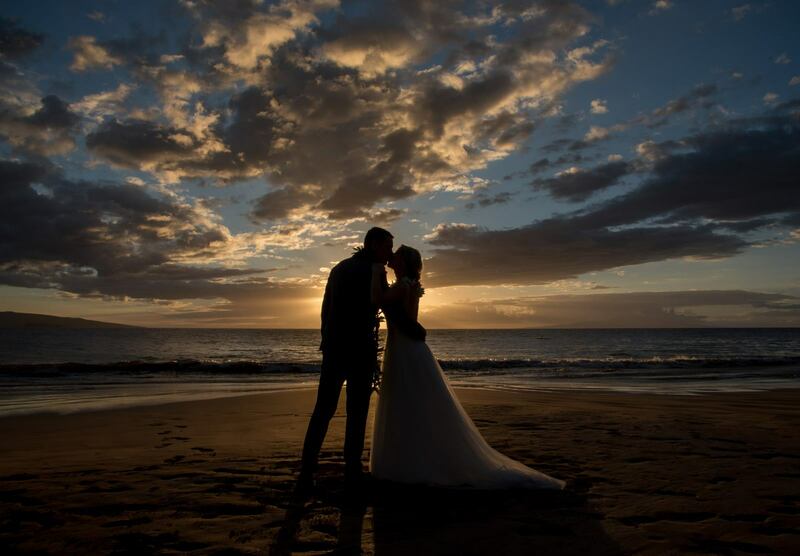 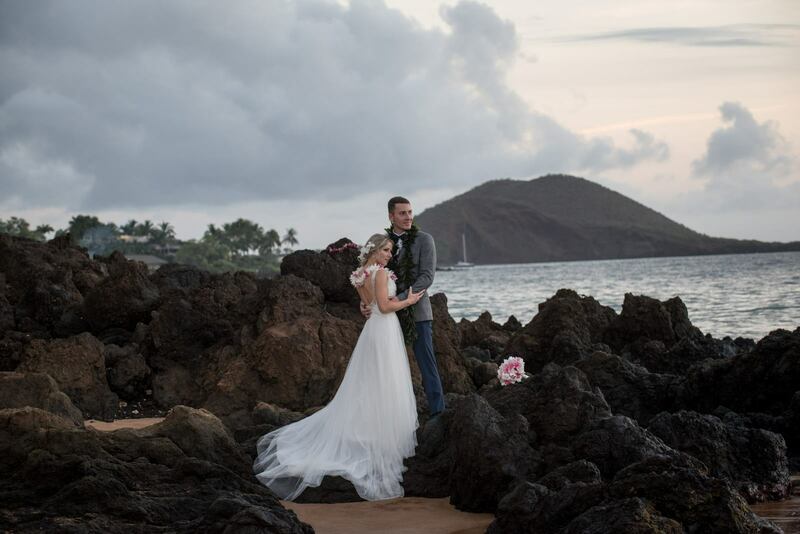 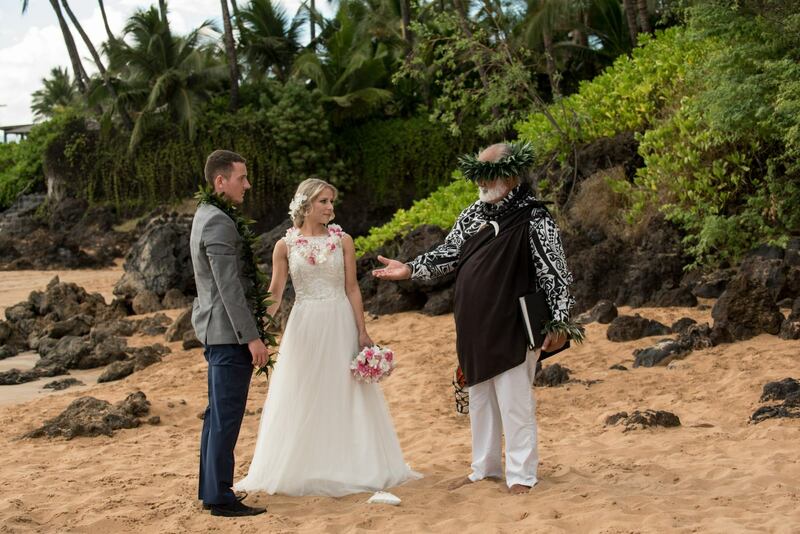 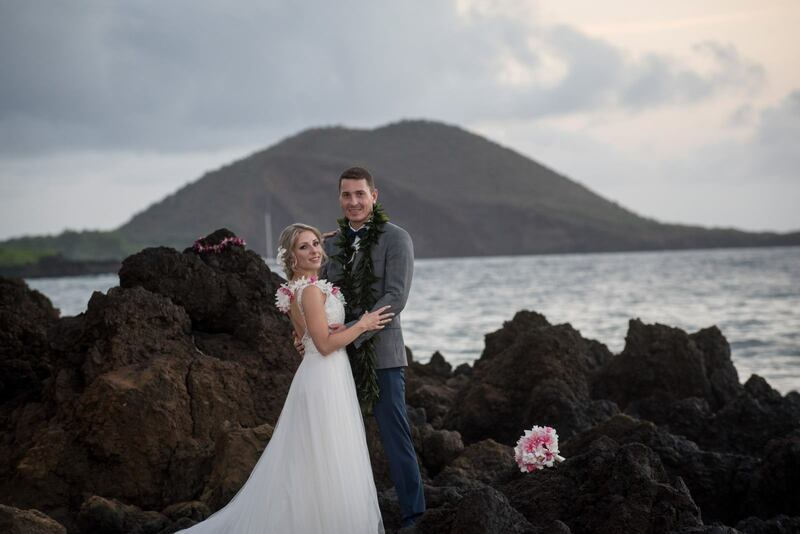 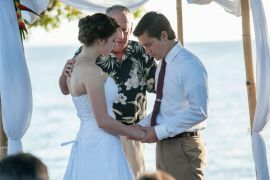 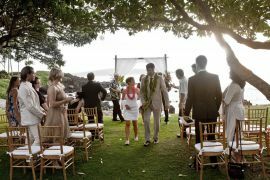 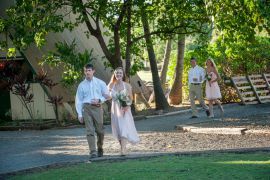 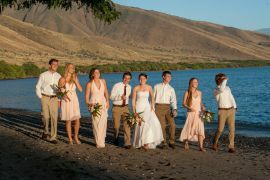 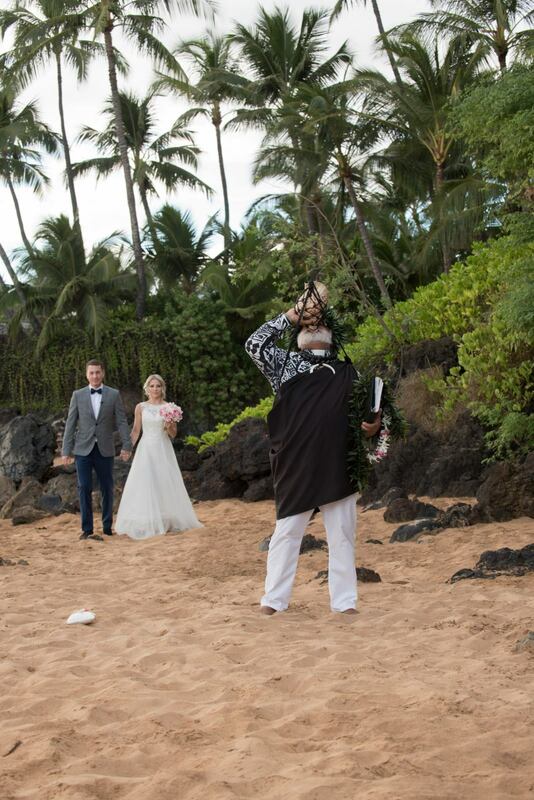 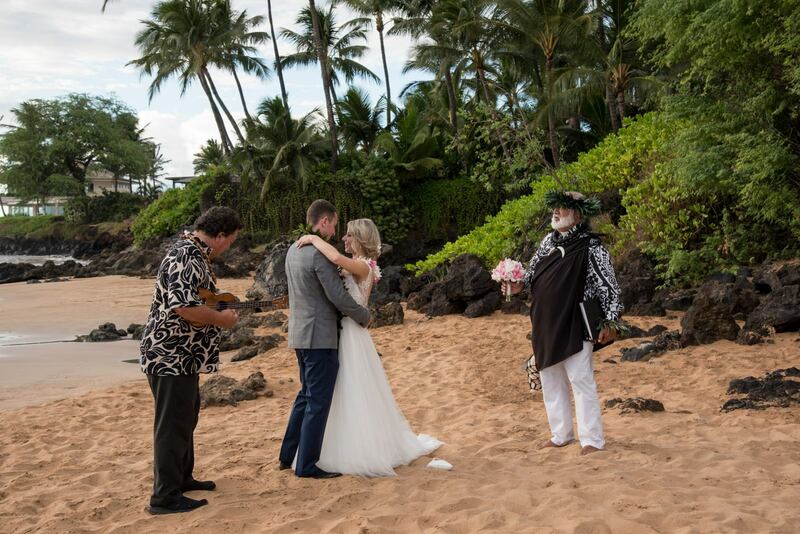 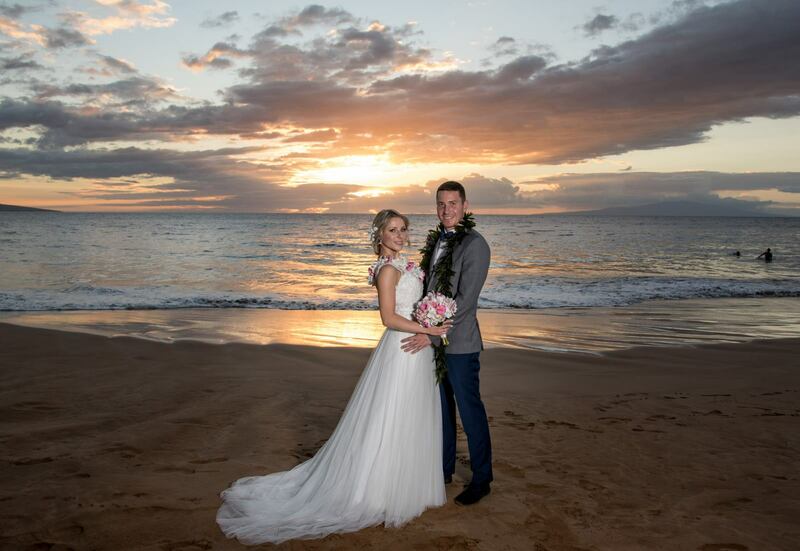 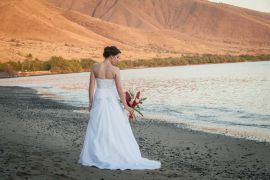 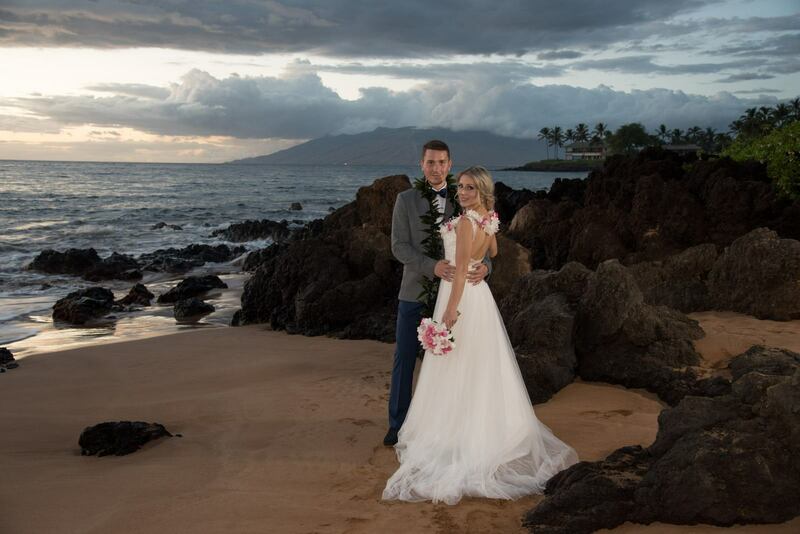 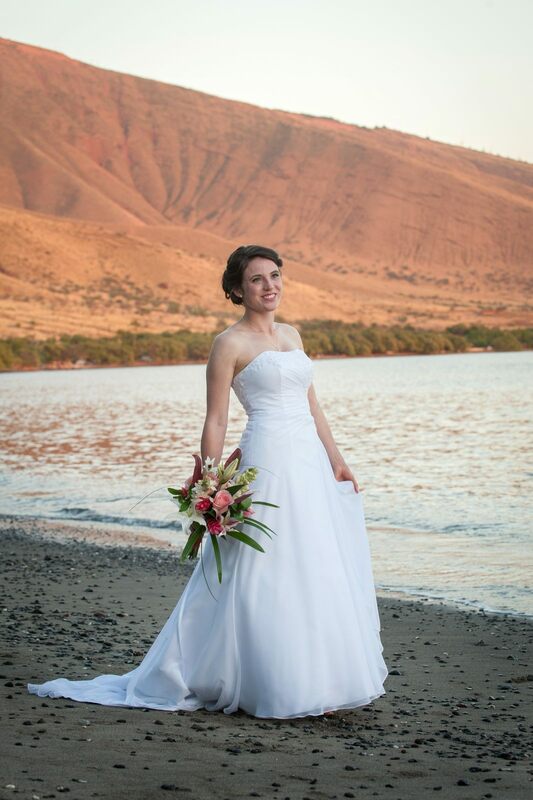 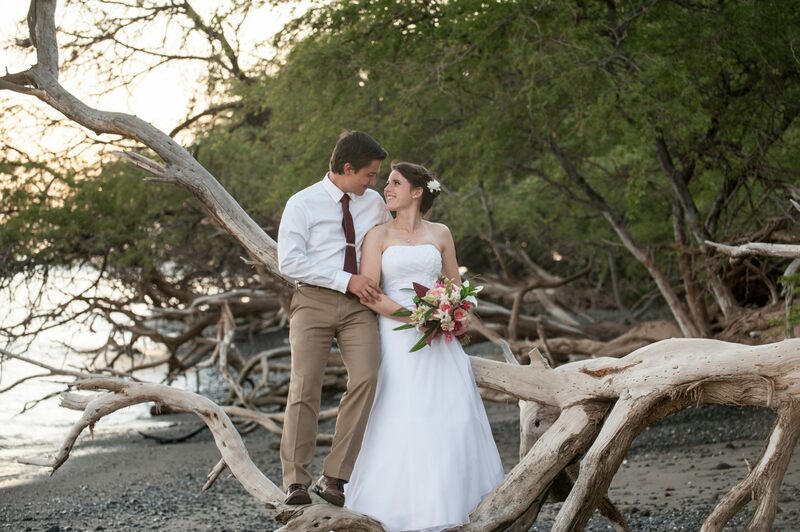 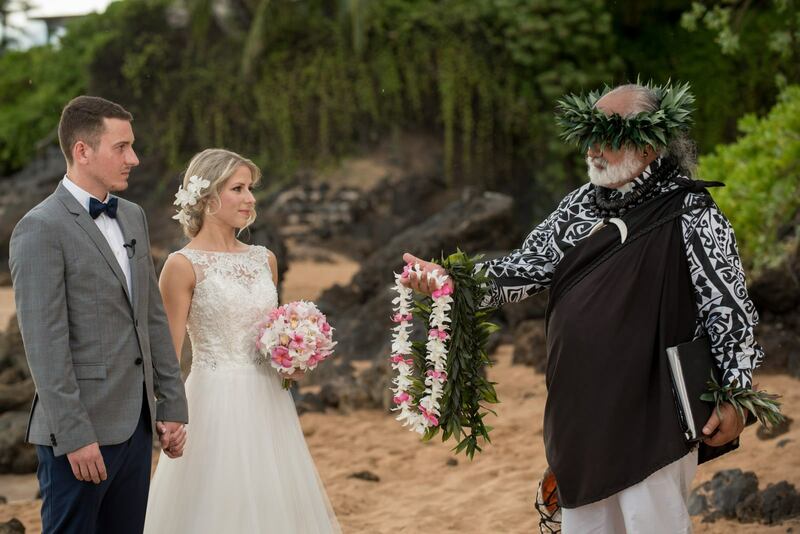 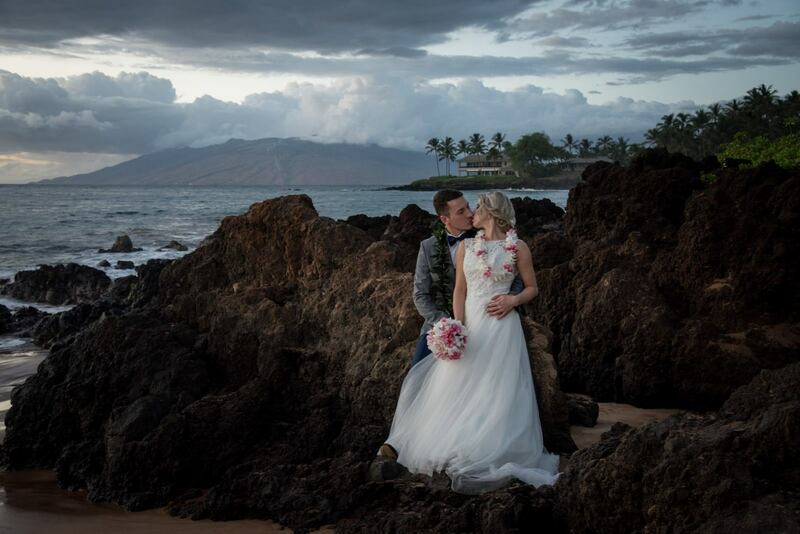 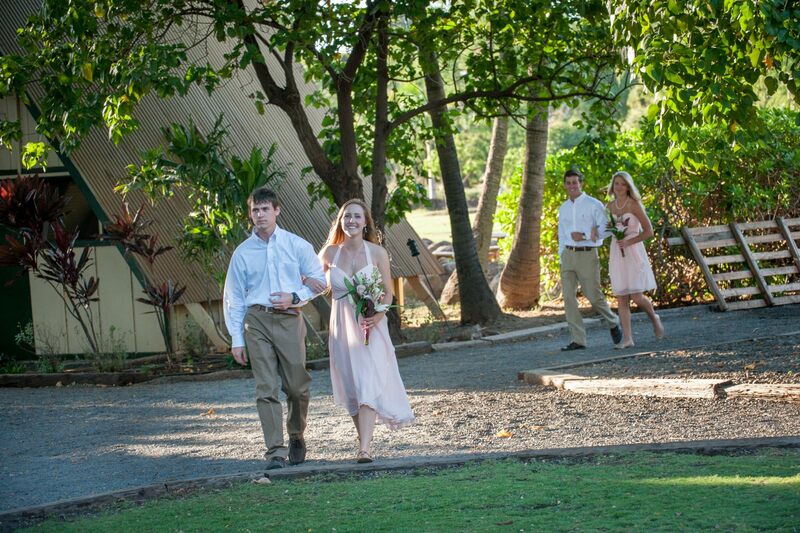 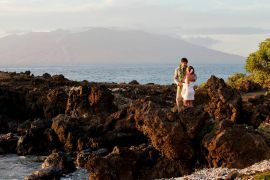 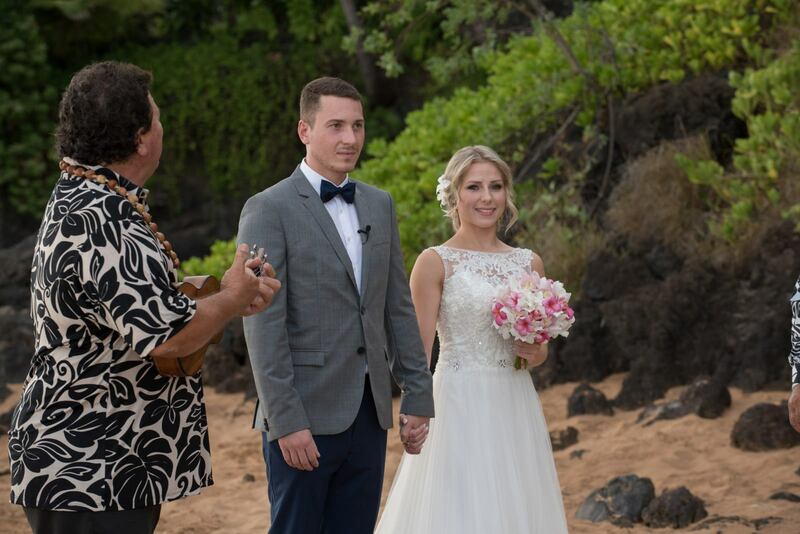 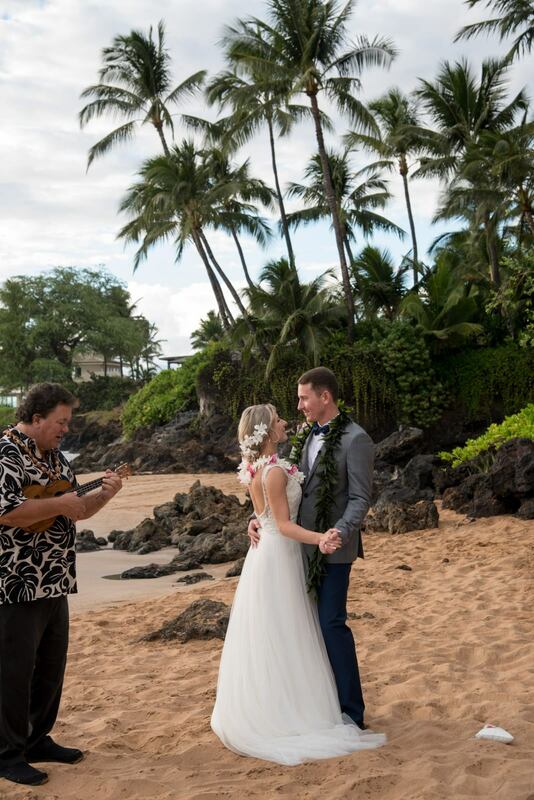 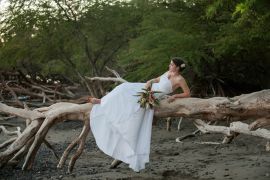 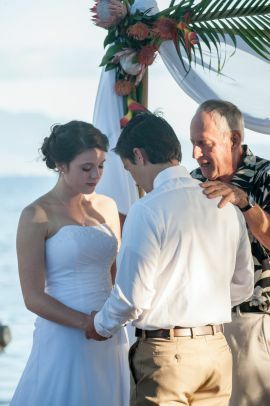 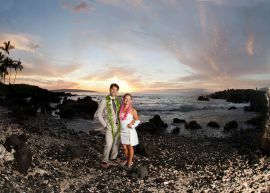 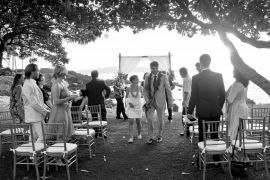 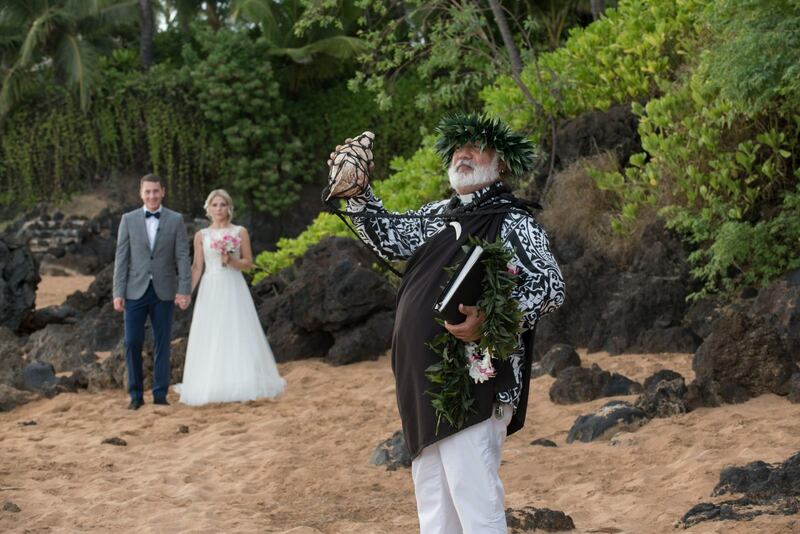 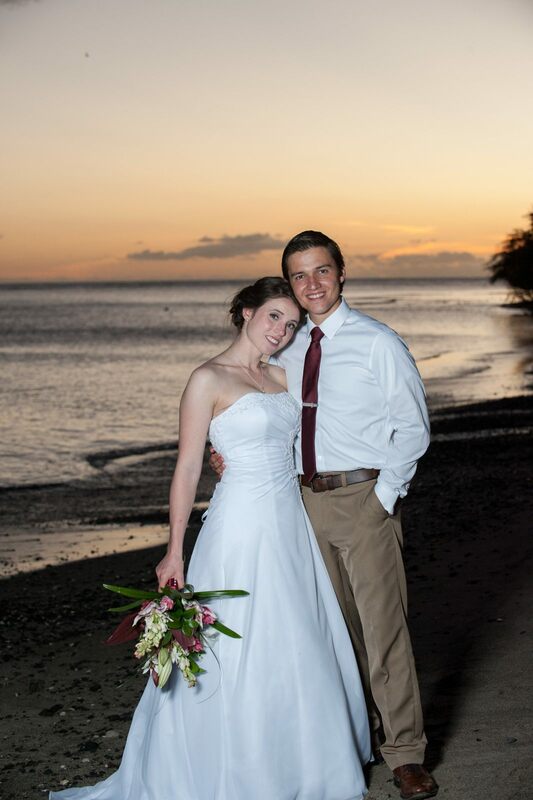 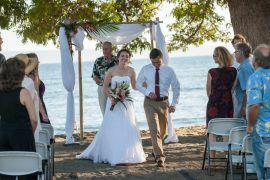 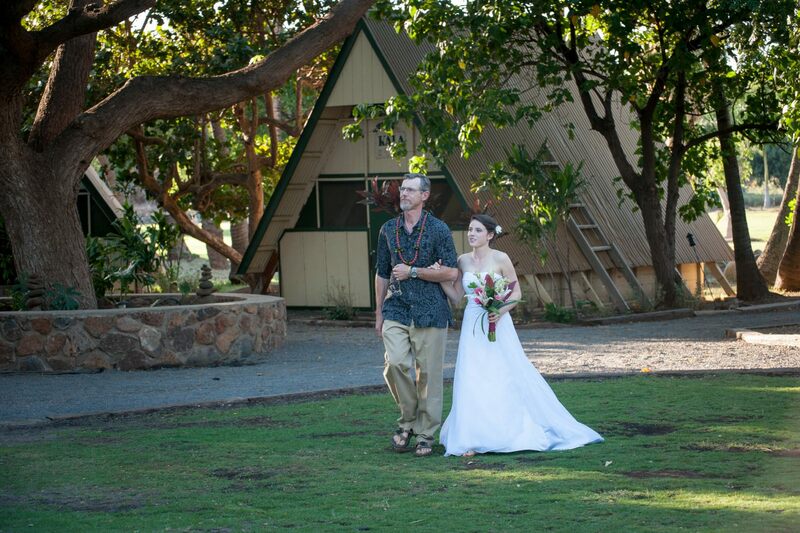 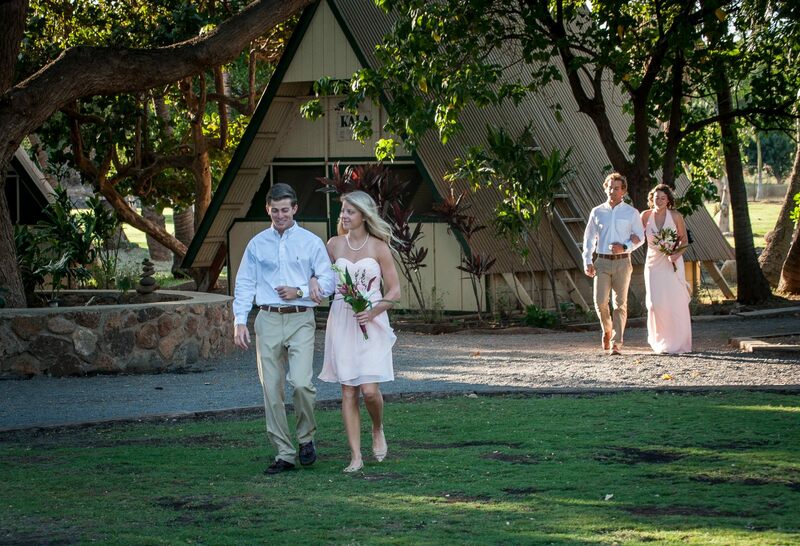 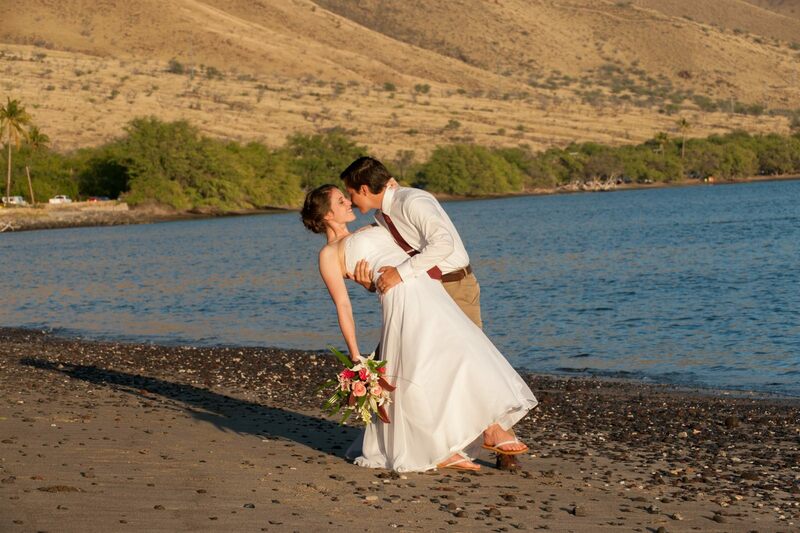 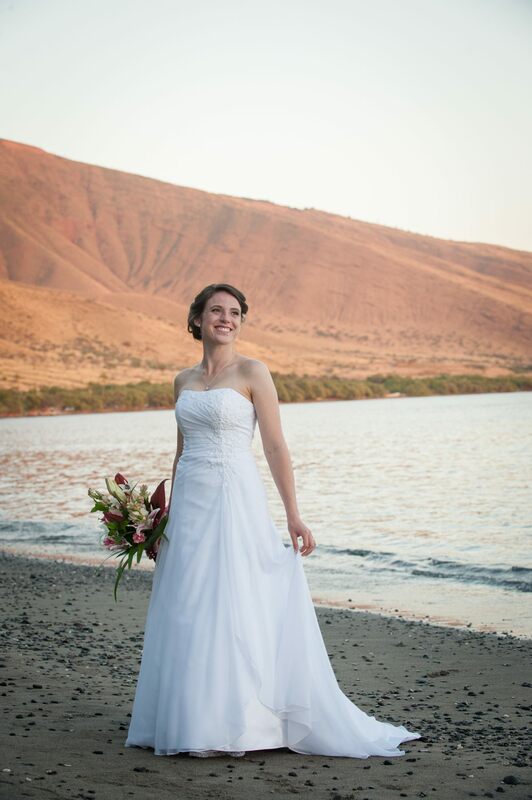 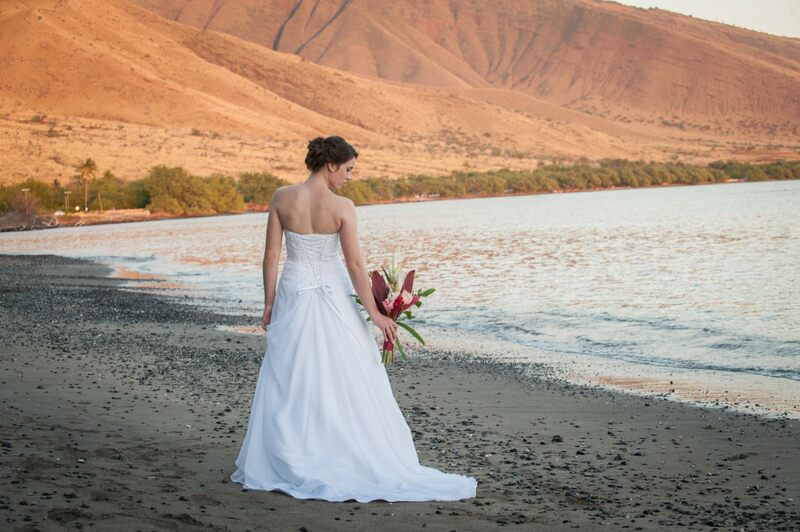 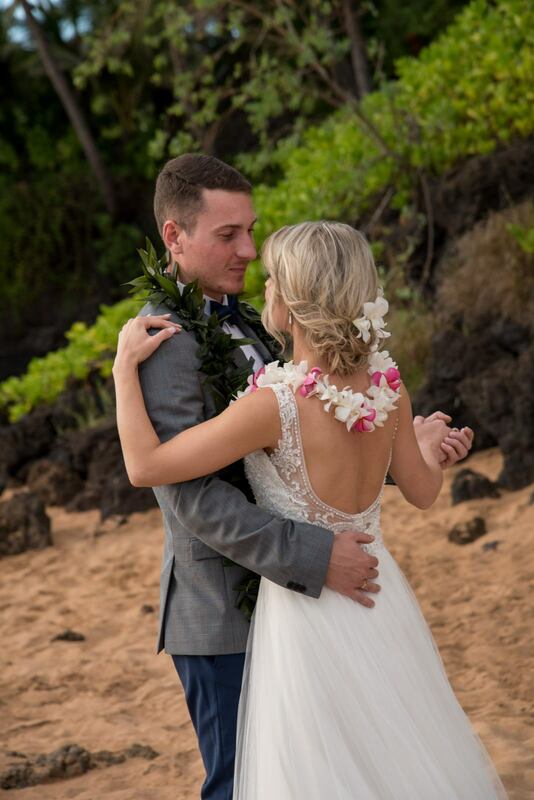 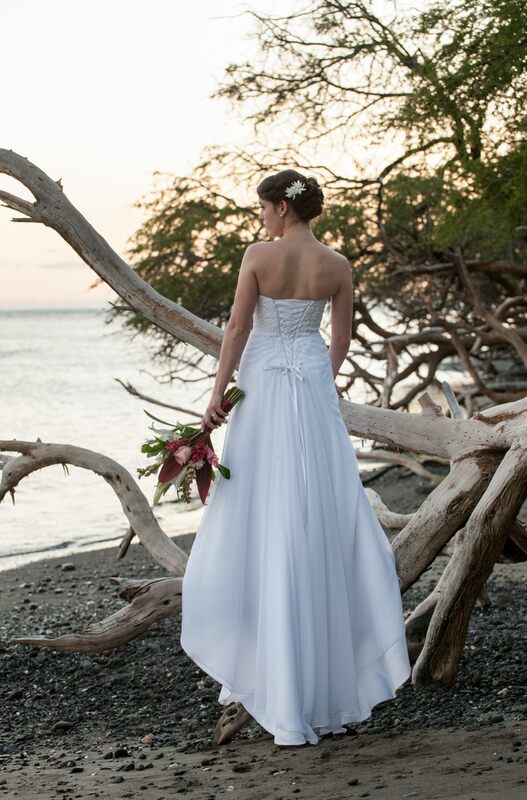 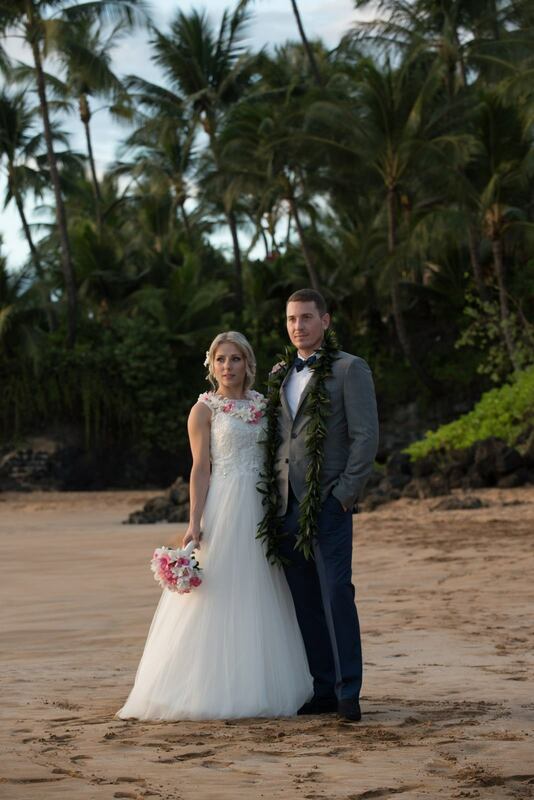 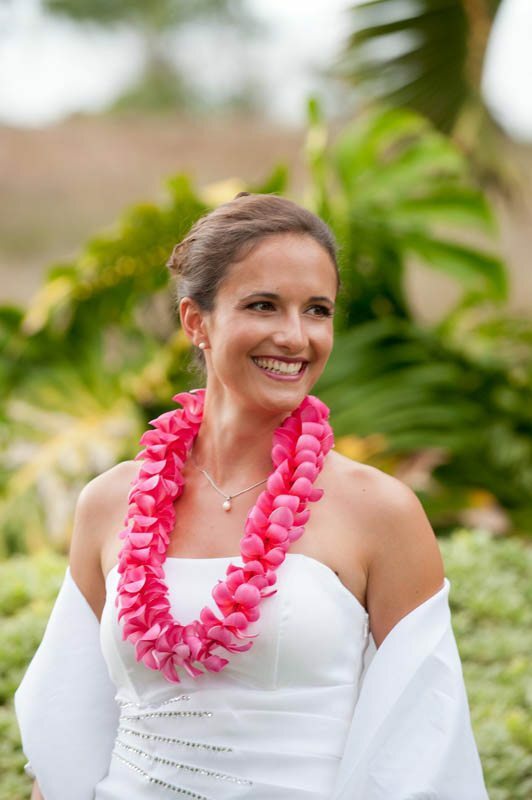 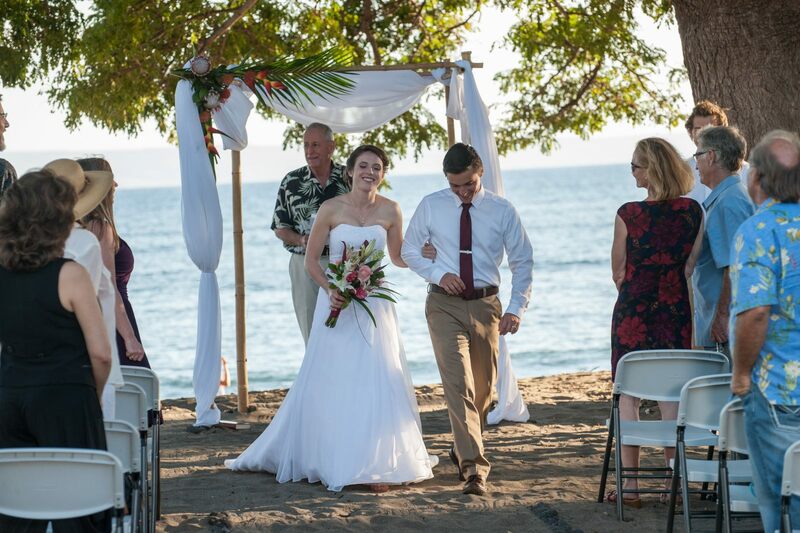 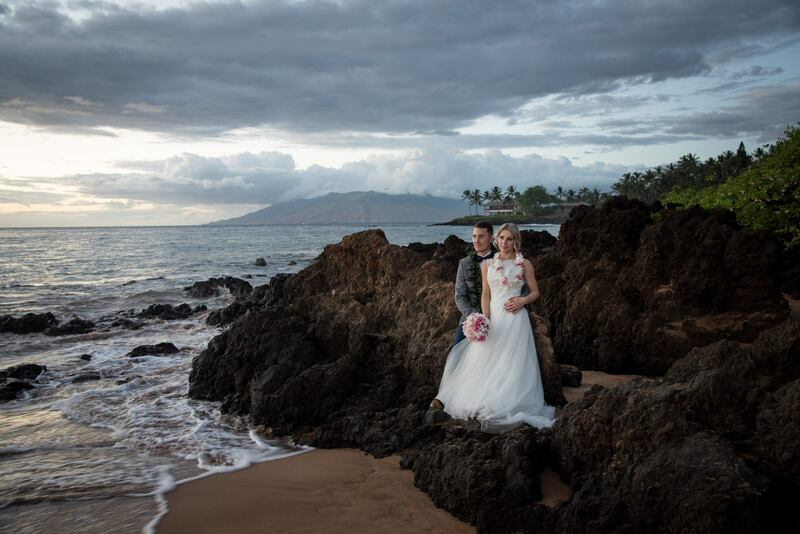 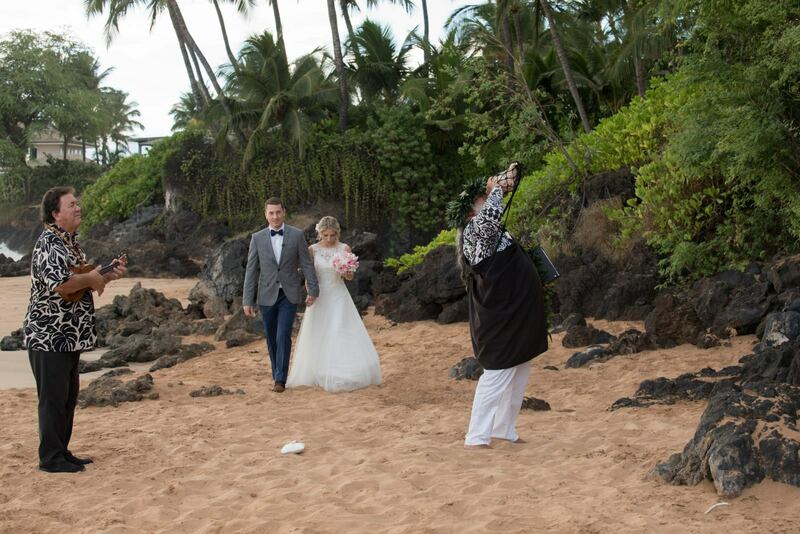 Steve Strand Photography was their Maui wedding photographer. 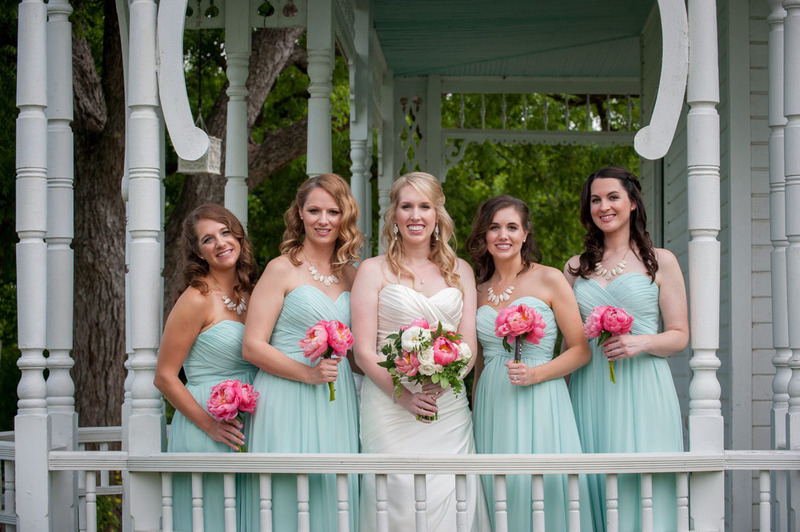 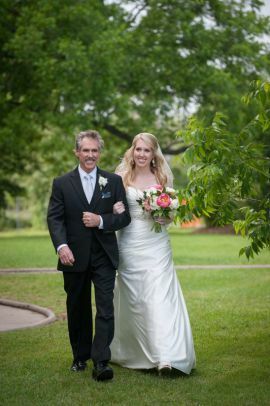 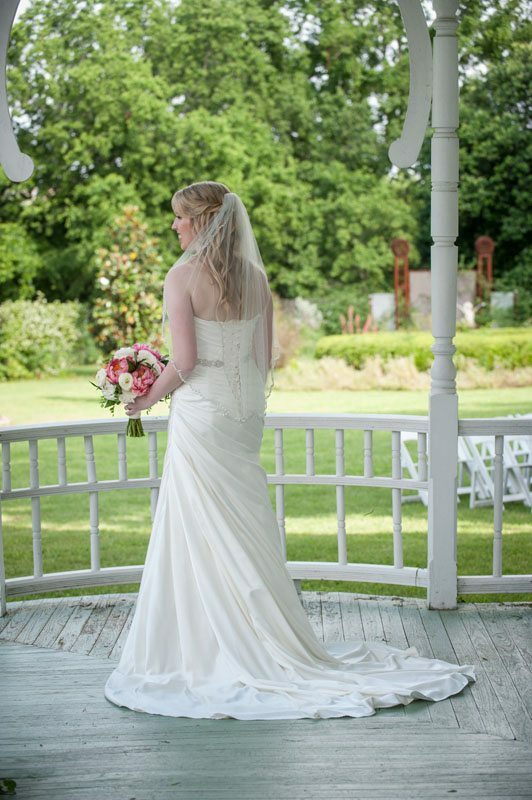 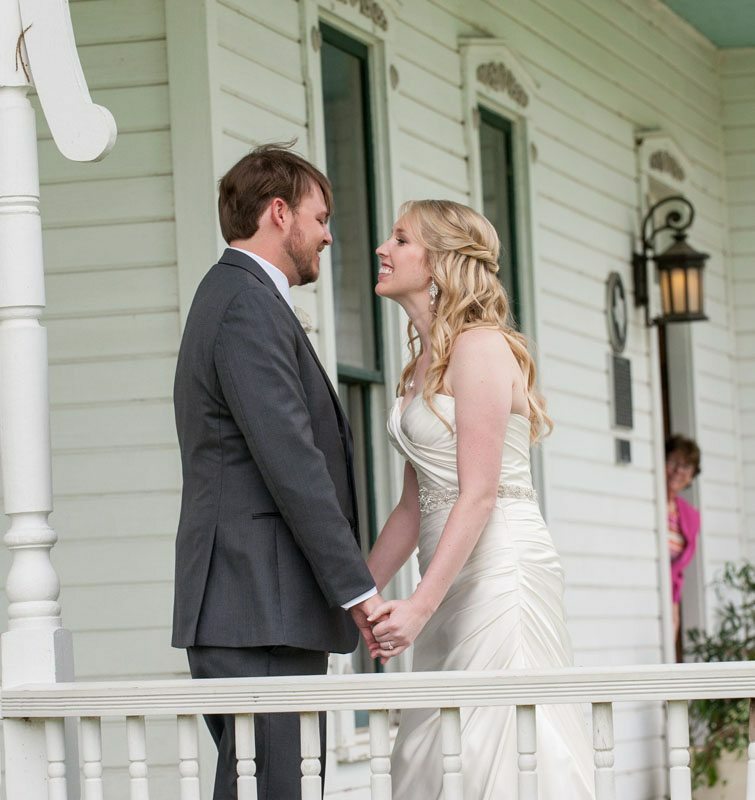 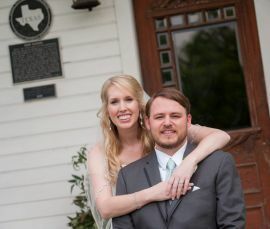 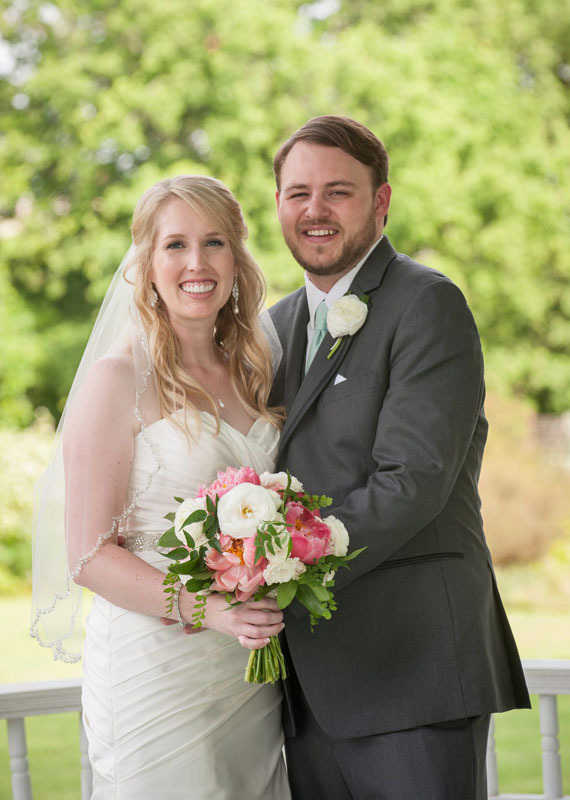 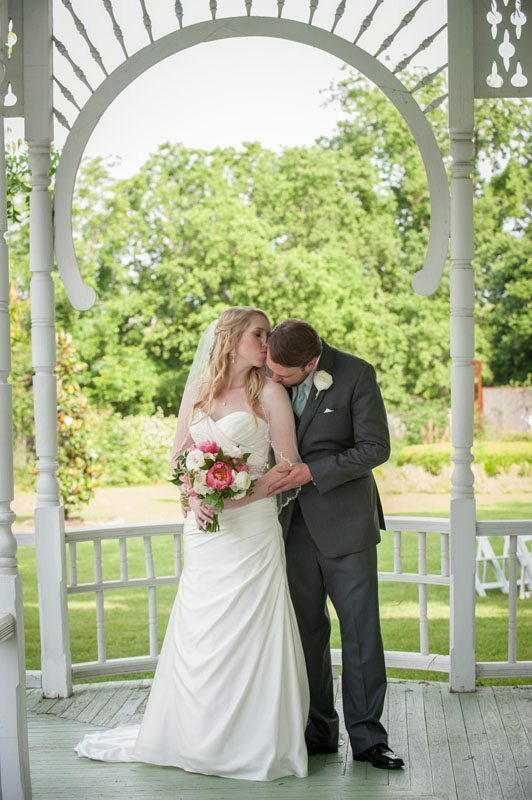 Morgan and Ryan got married on May 10, 2015 at Barr Mansion in Austin, Texas. 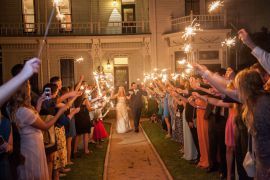 Barr Mansion is a one-of-a-kind setting for indoor/outdoor weddings, featuring versatile and well-manicured grounds, an Eastlake Victorian mansion, sustainably-crafted modern ballroom, full-service planning, and certified organic cuisine. 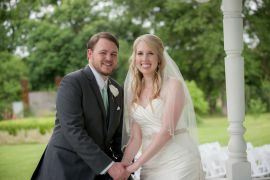 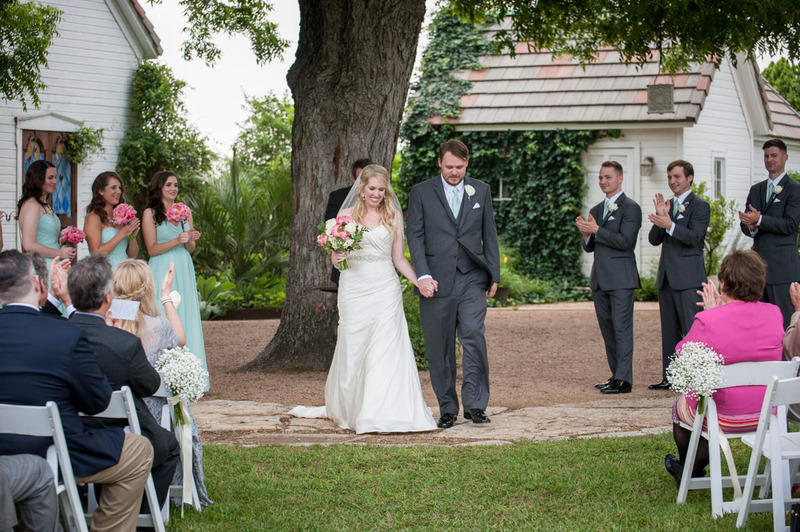 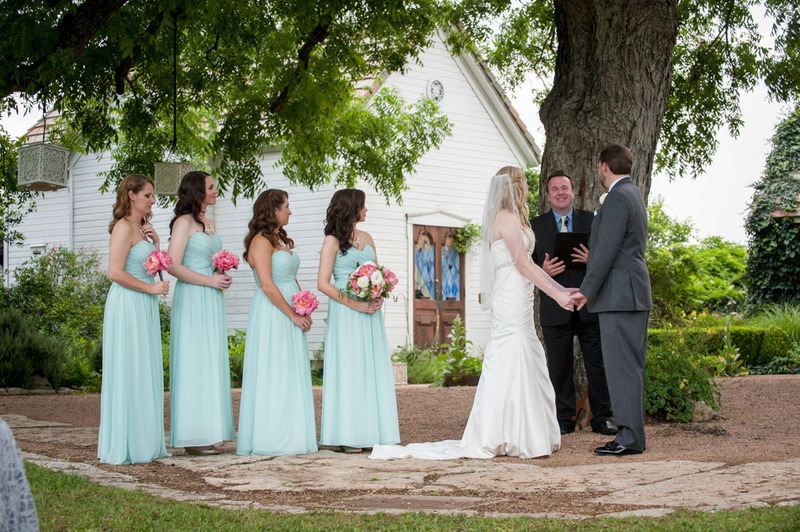 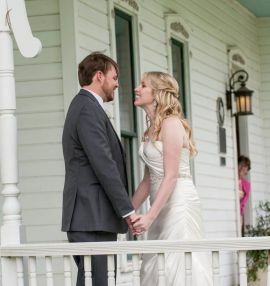 Morgan and Ryan had their ceremony under a beautiful pecan tree situated adjacent to the white Victorian house with white wooden chairs lining the lush green lawn. Although there was the threat of rain all day, the skies opened up and even provided a bit of sunshine just in time for their vows. Their ceremony was officiated by Reverend James Simmons, who was also the Officiant in Ryan’s twin sister’s wedding. 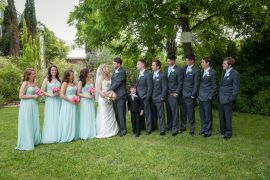 And they were not the only twins in the wedding party! 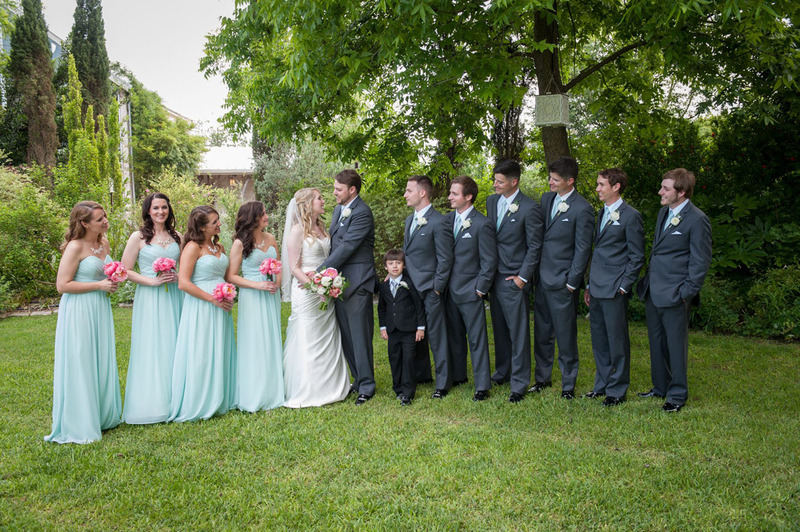 In fact, there were three sets of twins total, including Ryan’s twin brothers as well as his twin best friends! 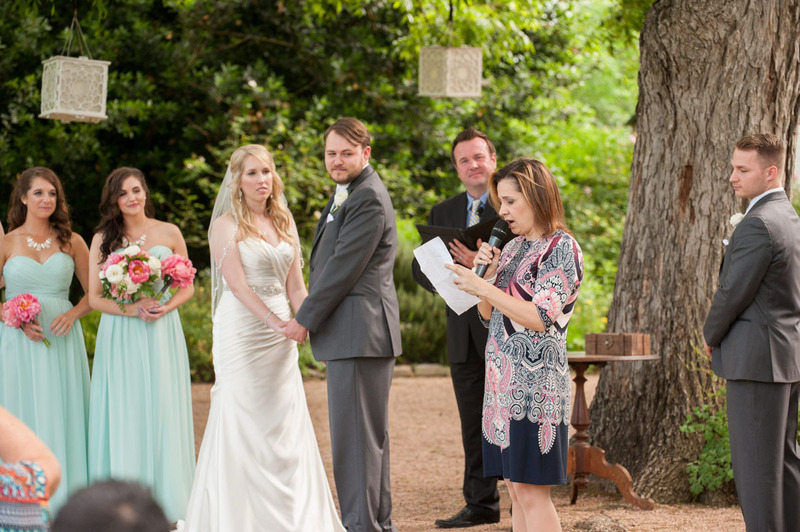 A very unique part of Ryan and Morgan’s ceremony was their Love Letter and Wine Box. 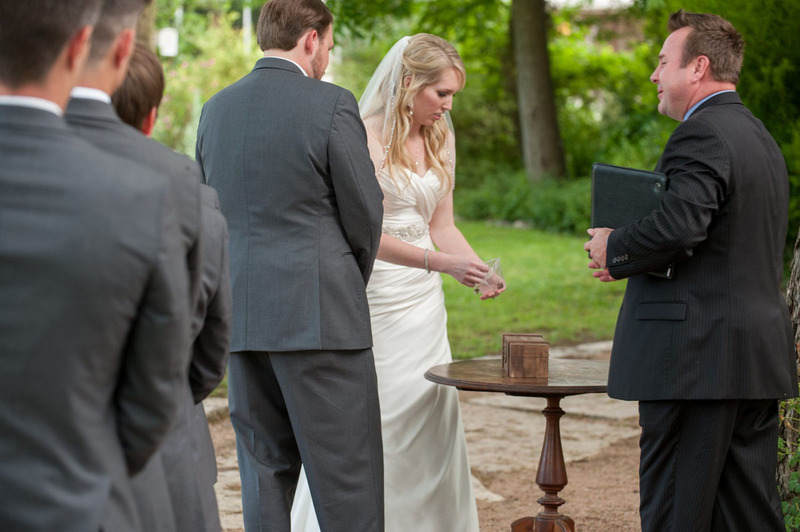 They wrote each other love letters and locked them in a box with a bottle of wine during the ceremony. 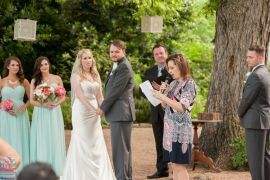 The letters are to be opened and read over a glass of wine on their 5th wedding anniversary to reflect upon the reasons they feel in love and chose to marry on this day. 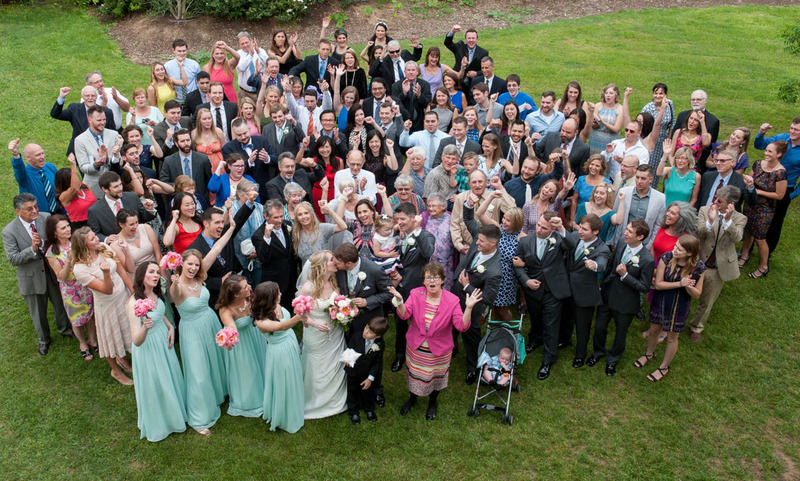 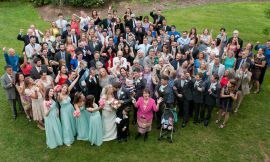 After the ceremony, the guests headed over to take a group photo on the lawn in front of the Mansion. 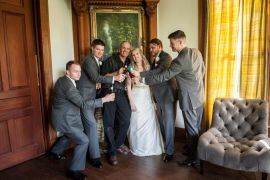 Following the photo, they enjoyed a cocktail hour featuring drinks and small bites while the bride and groom finished taking family photos. 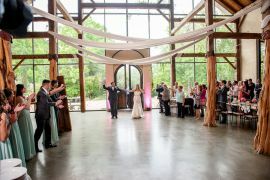 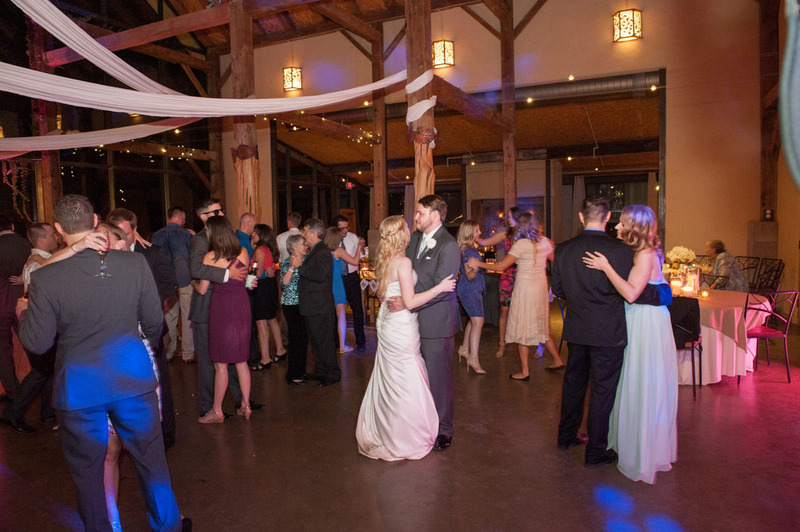 The reception then began inside Artisan Ballroom featuring a full glass facade on the front and wooden exposed beams inside. After dinner, drinks, toasts, cutting the cake, and the bouquet toss, the dance floor was lit up by pink uplighting and DJ Joel Giorgio with Greenbelt DJ Productions got the dance party started! After lots of fun and dancing, the night ended with a sparkler send-off into the couple’s white getaway limousine. 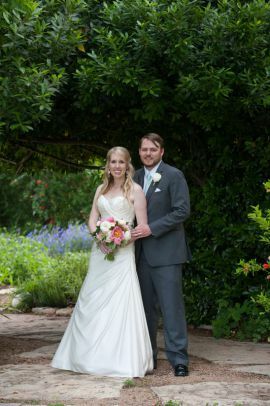 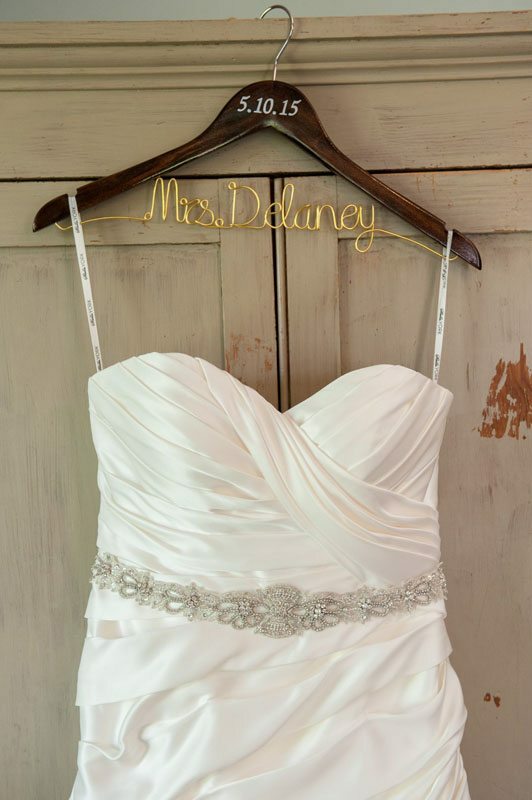 The bride wore an ivory satin a-line dress with a sweetheart neckline, with a handmade vintage belt and a scalloped veil from Belle Saison Bridal. 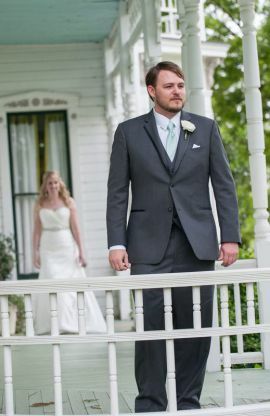 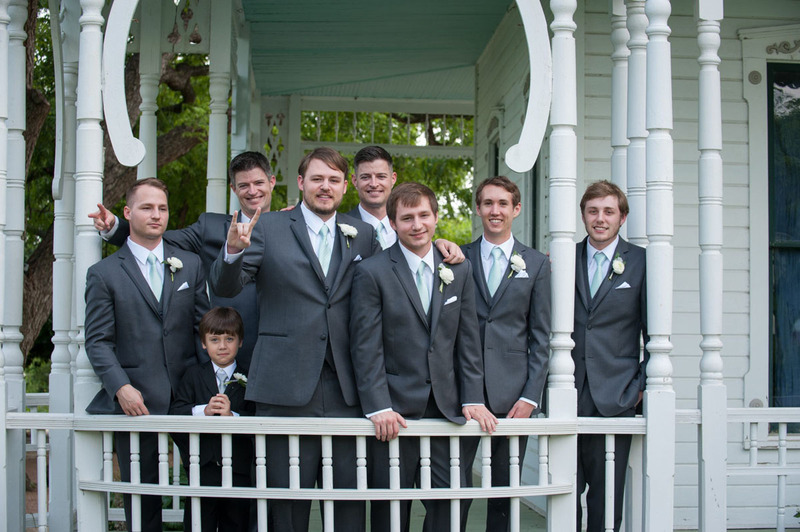 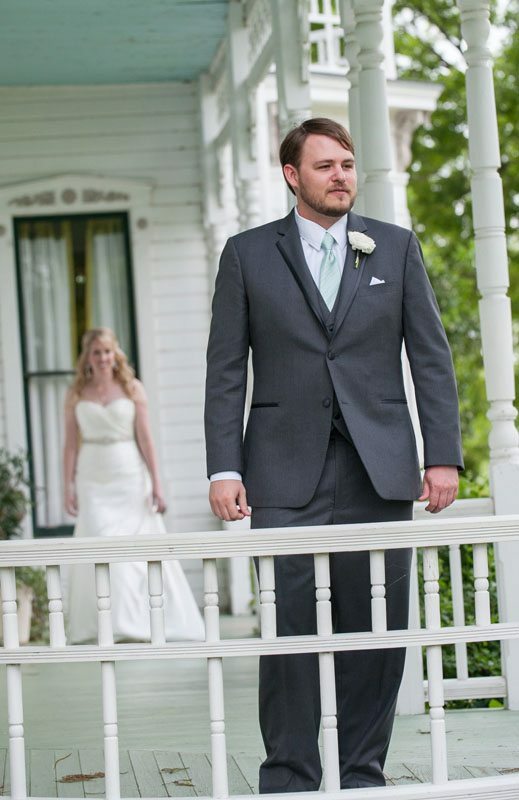 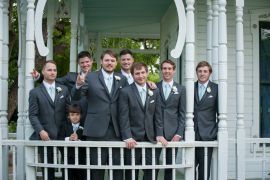 The groom wore a medium gray tuxedo with a white shirt and mint tie from Men’s Warehouse. 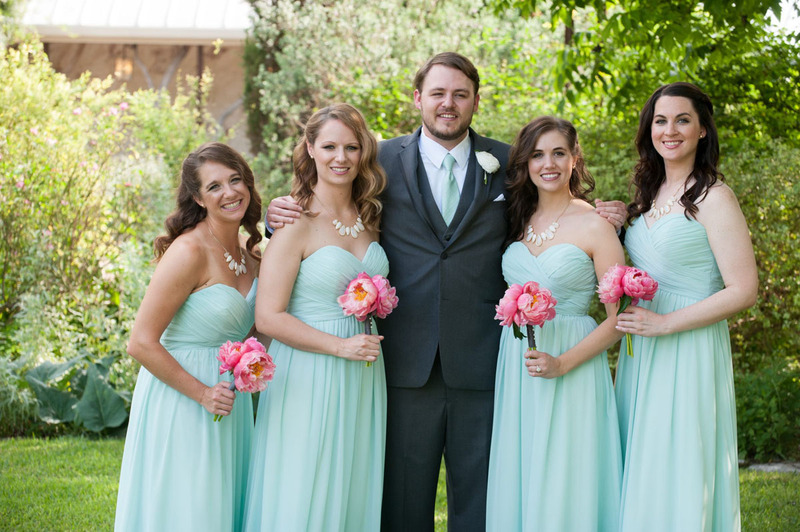 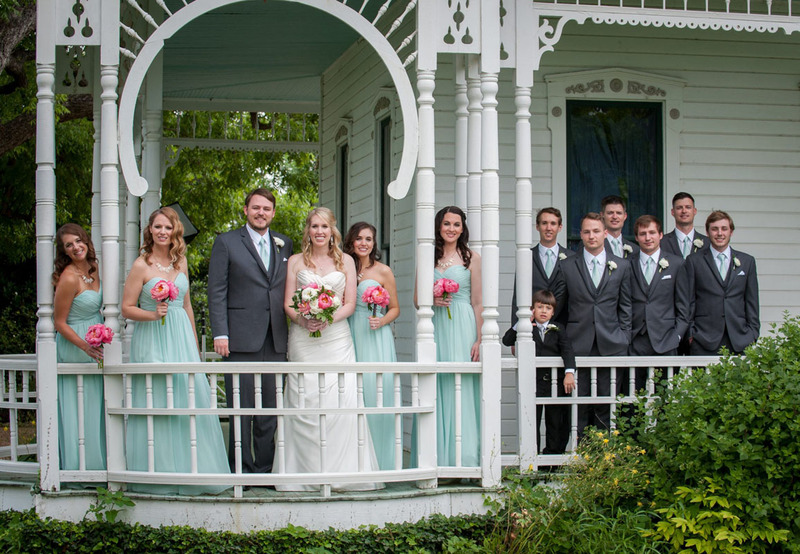 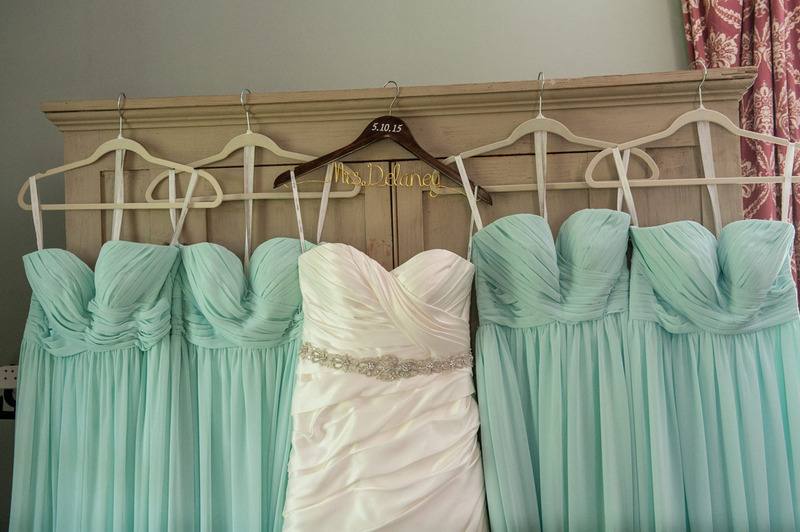 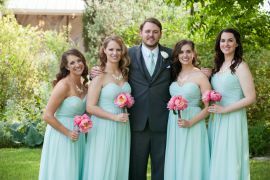 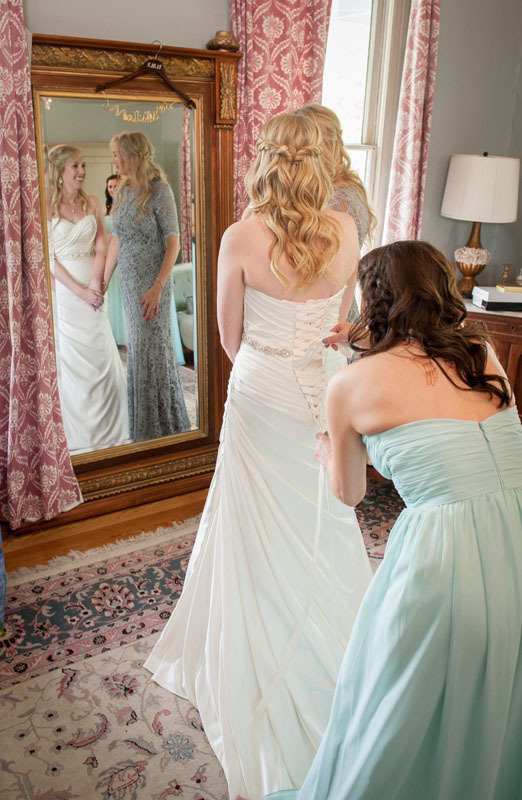 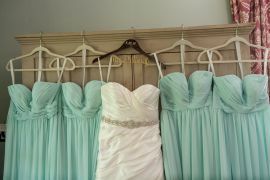 The bridesmaids were in floor-length, mint chiffon strapless dresses and the groomsmen matched the groom with a slight variation to their ties. 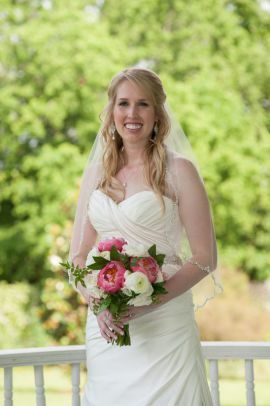 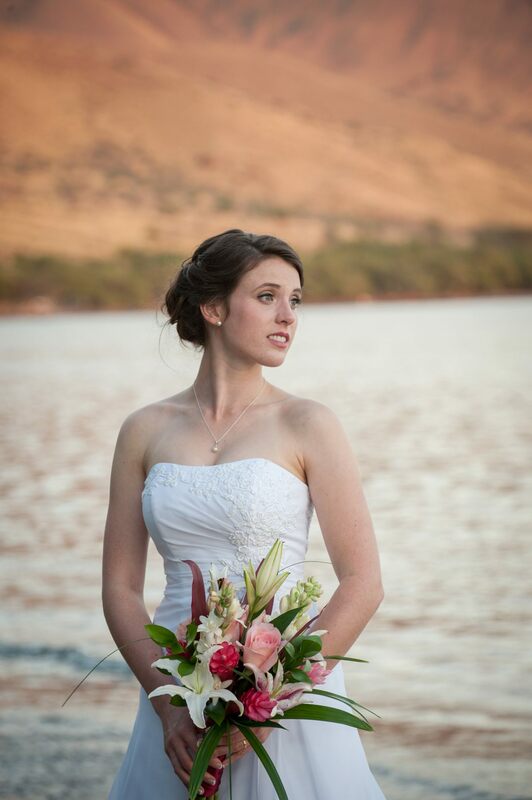 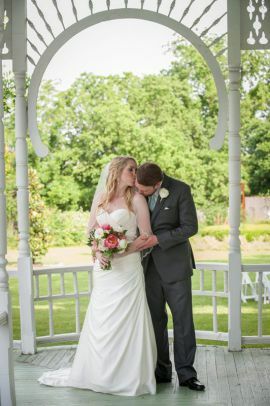 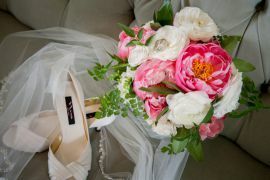 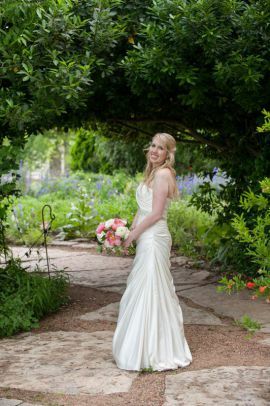 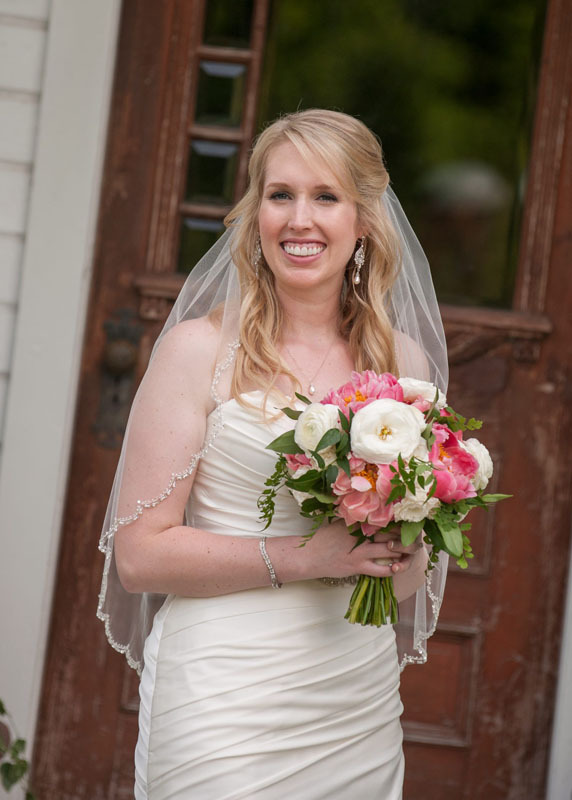 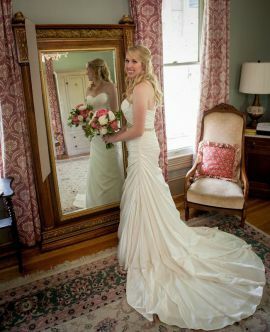 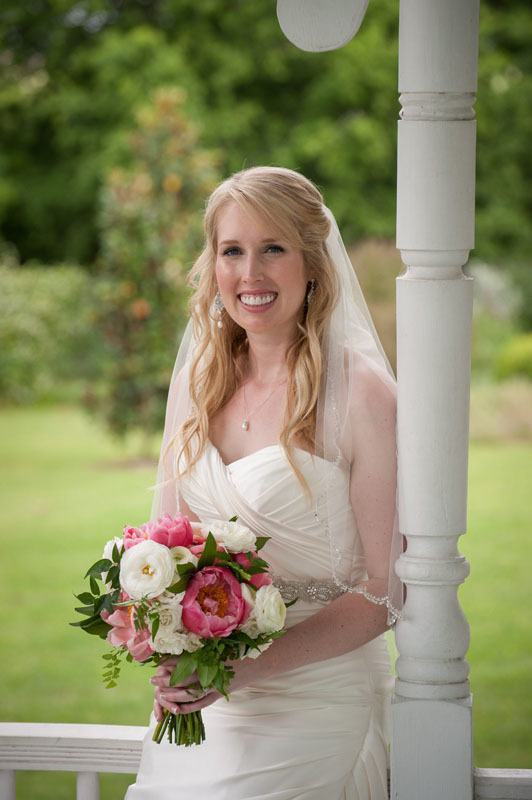 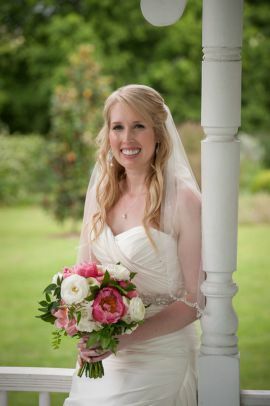 The bride held a bouquet of coral peonies, white ranunculas, and ivory spray roses mixed with touches of greenery. 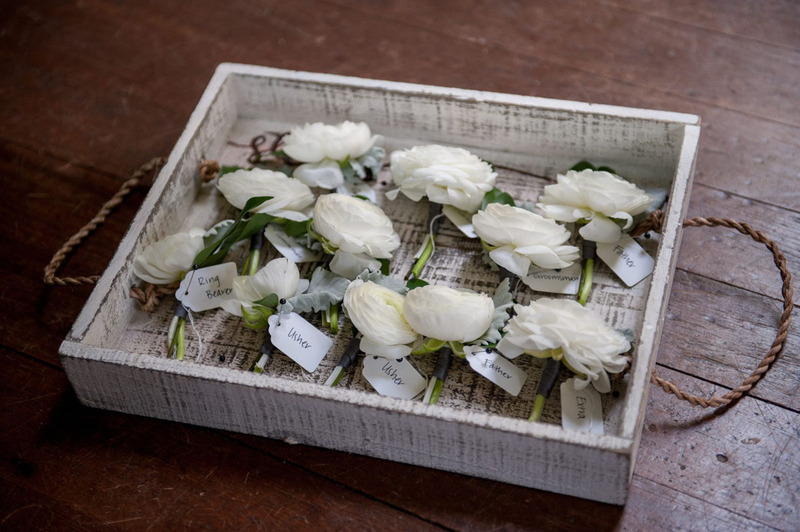 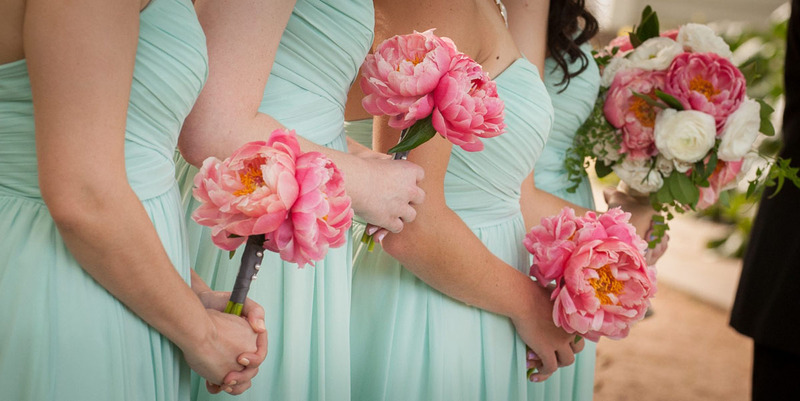 The bridesmaids held a small bouquet of three coral peonies and the groom and groomsmen sported boutonnieres of a single white ranuncula atop a bay leaf, all courtesy of STEMS Floral Design.